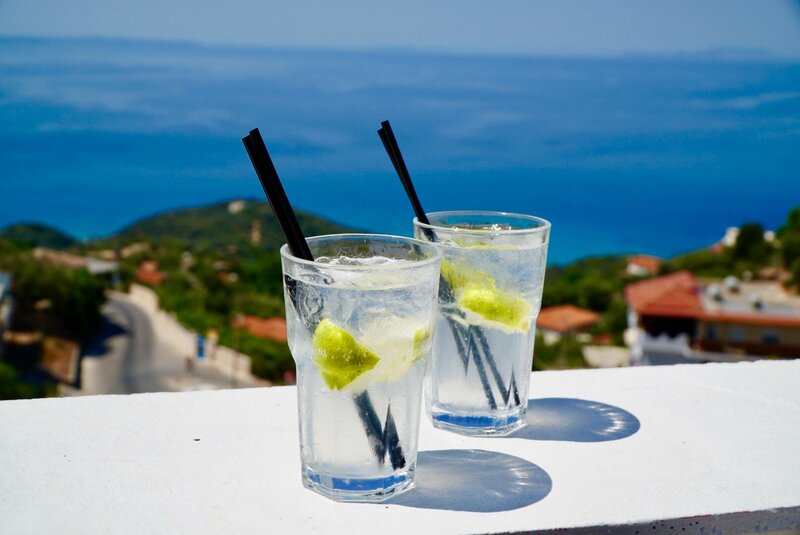 Adventurous or Relaxing – Why Not Both? 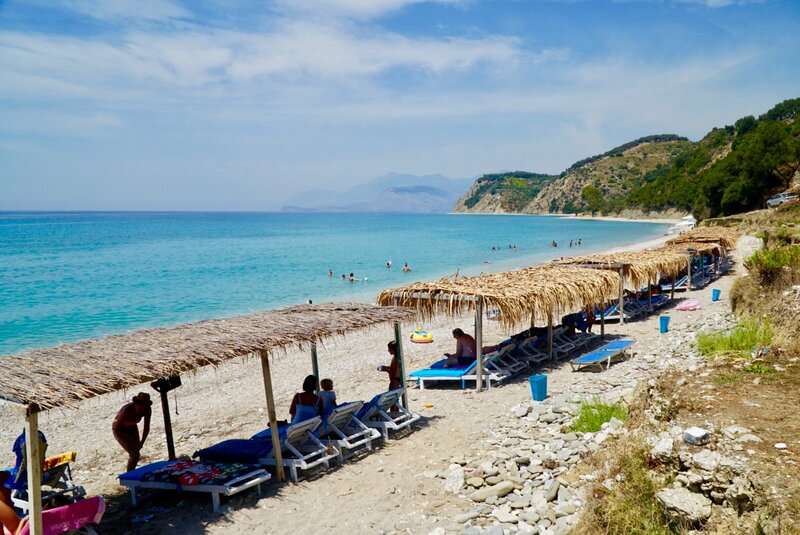 If you can’t decide whether or not you’d like an active and adventurous travel experience or a mellow and relaxing one, you should definitely take a road trip in Albania. 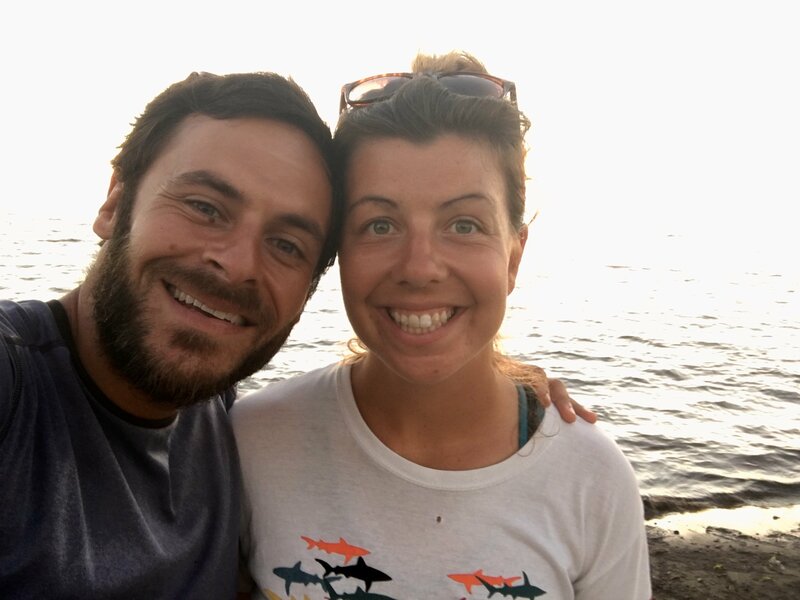 We road tripped for 8 days at the end of July, and the hot summer weather enabled us to hike and camp out at a few hidden beaches and relax by a poolside (and enjoy cocktails at a SUPER affordable psedo-luxury hotel). We even spent a few nights at a family owned guest house which was just a short way walking from a completely desolate pebble beach. 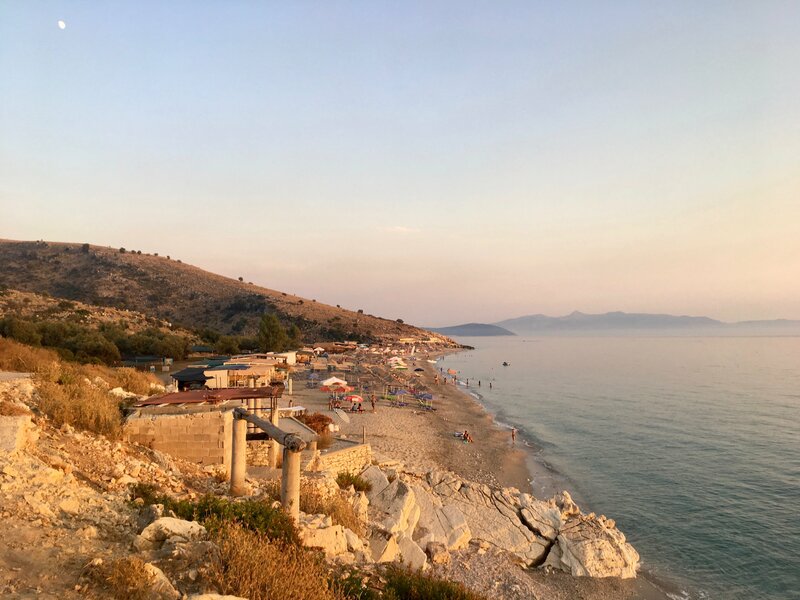 Our road trip in Albania gave us everything we wanted in a travel experience – excitement, adventure, relaxation and rejuvenation – and we’re certain it will give you the same too! 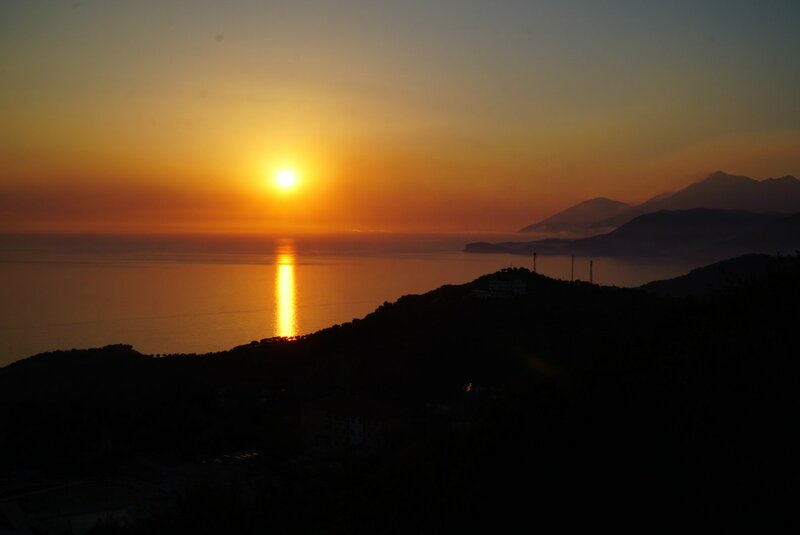 Here is a small taste of what you’ll experience on your road trip in Albania! 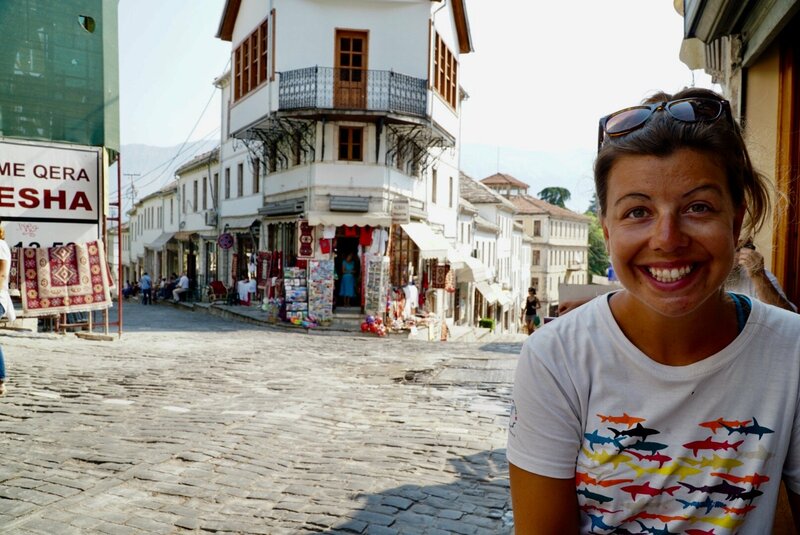 Planning a road trip in Albania is SUPER simple. It took us ~2 hours of planning time. In fact, we did it while we were still traveling and just after we had finished a 10-day backpacking trip on the Via Dinarica Trail in Montenegro. Since this is quite an off the beaten path travel experience, none of the accommodations were fully booked, thus we had no problem booking places on the fly. I cannot underscore how easy it is to plan a road trip in Albania. No matter the season, when we travel we bring our raincoats. Even if we just use them as a windbreaker, they’re lightweight and super versatile, so we always have them with us. Julia uses this Marmot raincoat*, and I use this Marmot raincoat (it’s the same as Julia’s, just cut for men). Creating plastic waste with water bottles makes us both feel terribly guilty. So, when we travel we use Hydro Flask water bottles. They are rugged, reusable and best of all, insulated. On hot days we fill them with ice water, and on cold days we fill them with warm water. When we’re in a country where we’re not able to safely drink tap water, we bring this super simple, super lightweight, super effective, and super affordable in-line water filter by Sawyer. 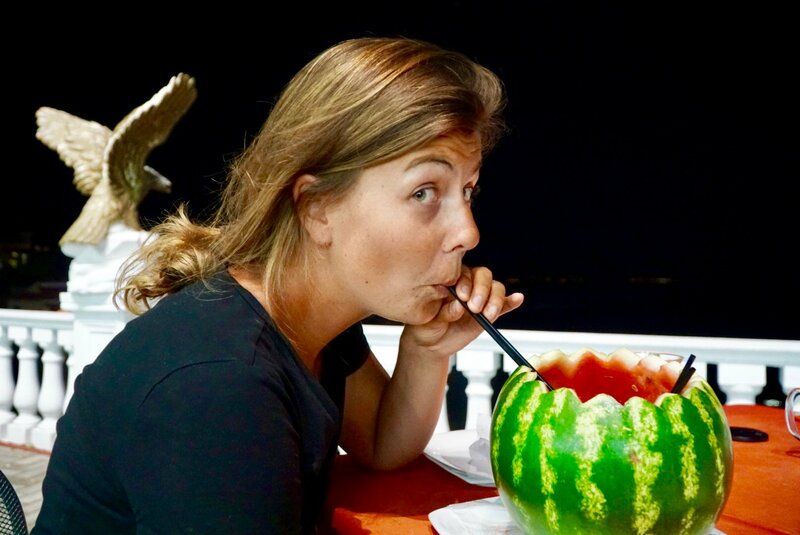 It allows us to drink water from the tap or from a wild water source without having to worry about getting sick. It also saves us from having to waste money on bottled water. Since we were relying on our phones for navigation, we also brought a power bank for our phone. When we’re car camping, we basically bring sleeping bags, pads, and a tent. If we’re cooking, we’ll bring a small stove and some cooking utensils too. 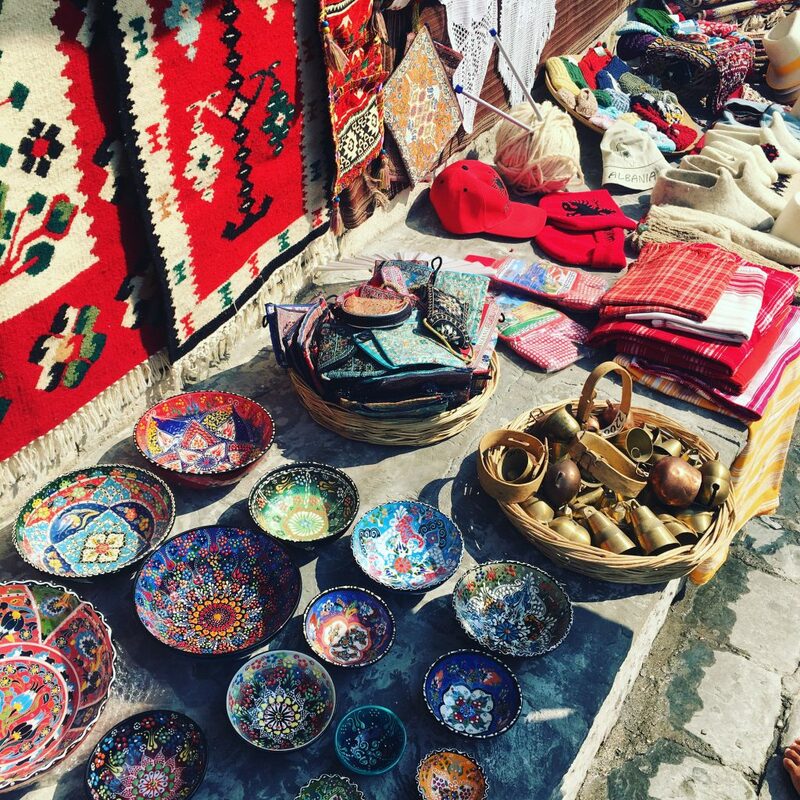 On our road trip in Albania, here is specifically what we brought. 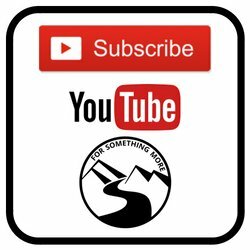 We have put a lot of details about our road trip in three places, (1) our road trip Google Map route (especially in the Points of Interest part of the map), (2) in the sections below and (3) in the captions of our pictures, also below. Note: The captions in the pictures below correspond to the Points of Interest on our Google Map. 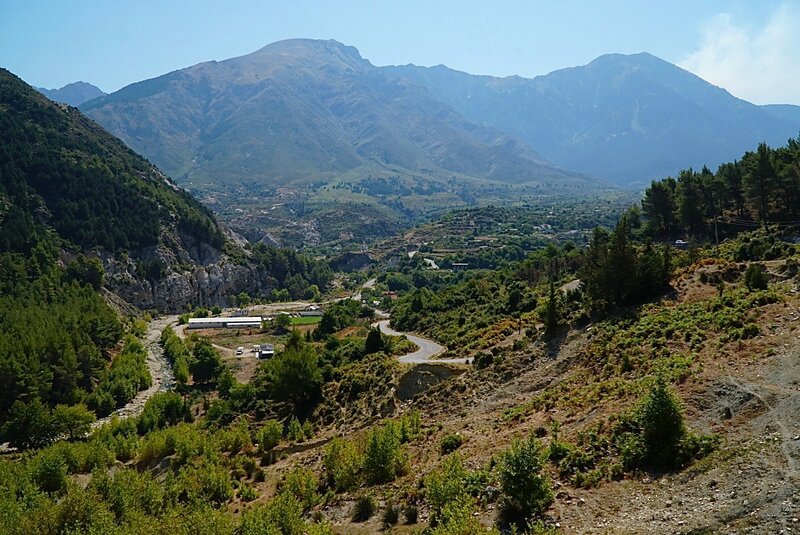 You can replicate our exact trip, if you’d like, but we recommend you use our materials as a guide for planning your own road trip in Albania. Basically, you’ll have to do the following five things. Have a look at Google Maps, and then plot your course. Do not feel obligated to follow our route. If you want a beach experience, drive along the coast. If you want mountains, head for the hills. 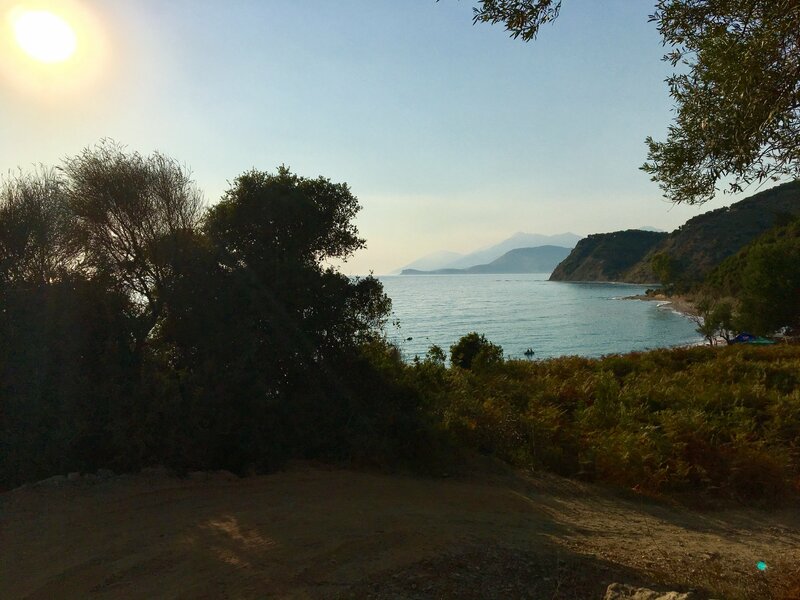 If you want both beaches and mountains, you can follow our road trip route by clicking here, as we indeed opted for a mix of beaches and mountains. 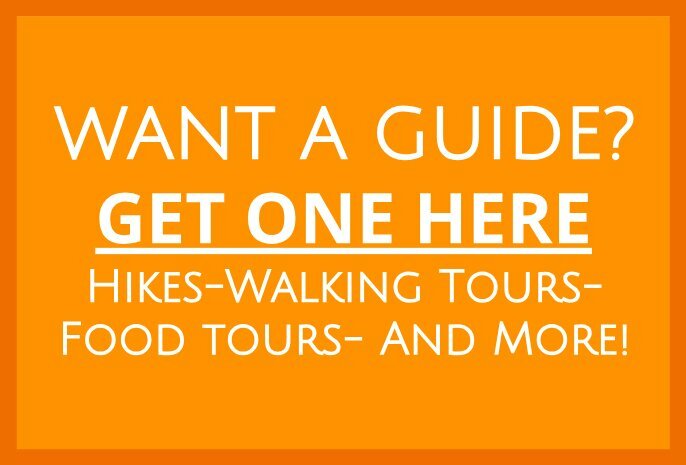 If you look at our route map, read the notes on each of our Points of Interest. We’ve put a lot of important details into each one of those. Our route is ~650km (~400 miles) long. As you can see from the map, we made a counterclockwise loop through the country. Distilled, we started in Tirana, drove south on SH8 to Sarande, and then drove north back to Tirana on a combination of SH4 and SH7. We spent 8 days on this trip, and we wished we had spent at least 8 more. 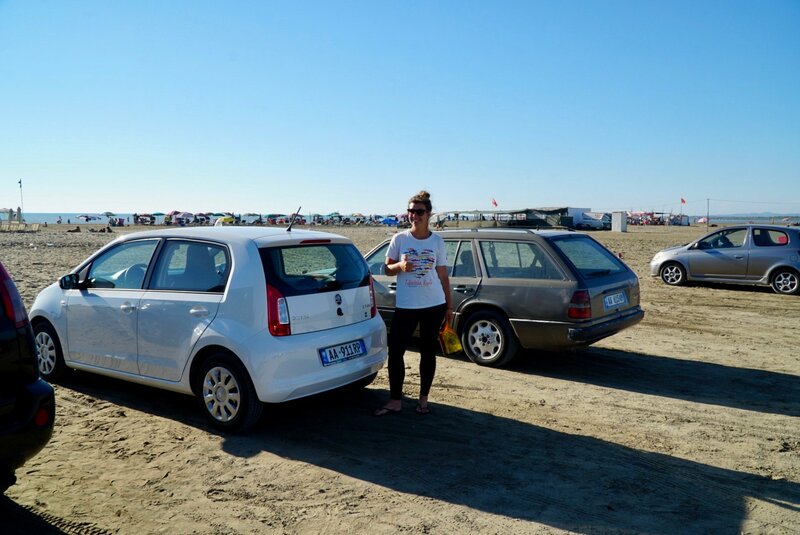 So, when you plan your own road trip in Albania, don’t be in a rush, and don’t plan too far in advance. Savor the spectacular landscape. 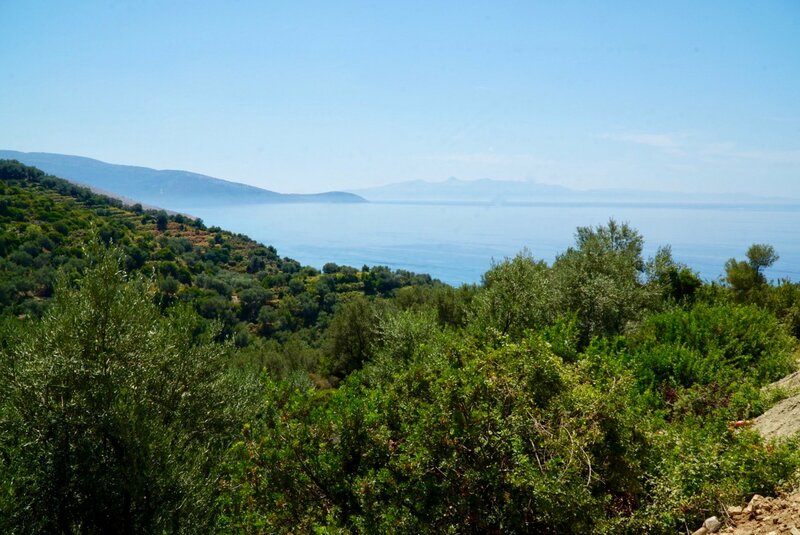 Drink LOTS of smooth and creamy espresso along the way, and eat as many Albanian seafood dishes as you possibly can. Meander through the country, and you’ll be rewarded with spontaneous, off the beaten path, culturally immersive experiences. 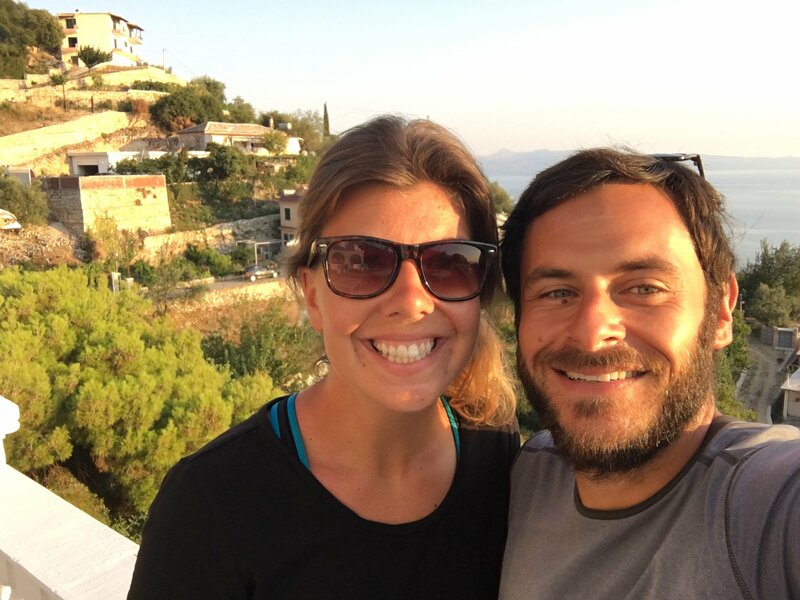 We never planned out more than 2 nights in advance, we were in Albania at the height of their tourist season – summer time – yet we never had any problem finding accommodations, etc. 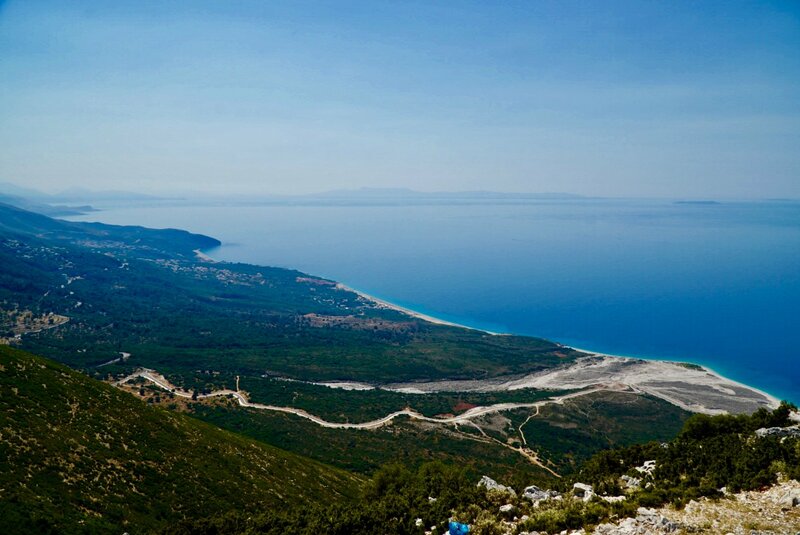 A road trip in Albania should be a relaxing experience, so don’t get too bogged down in the planning. 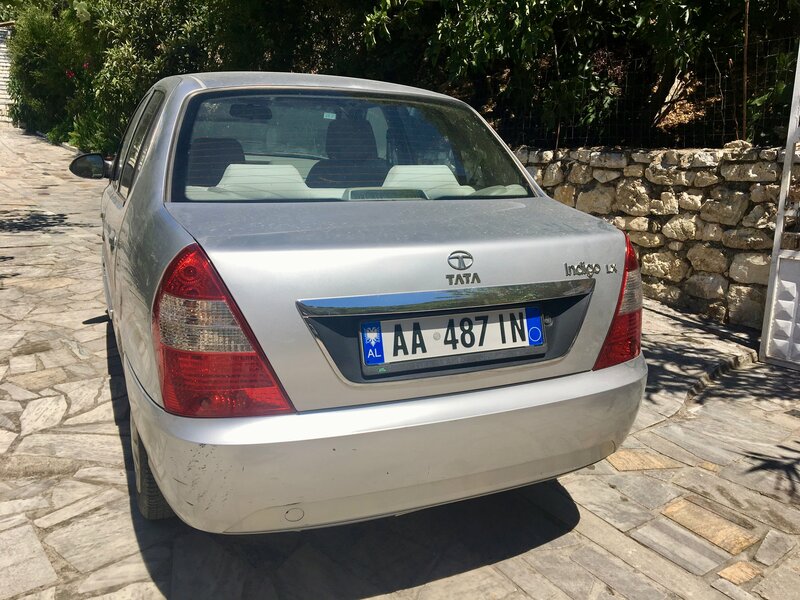 We rented our car from Enterprise in Tirana. 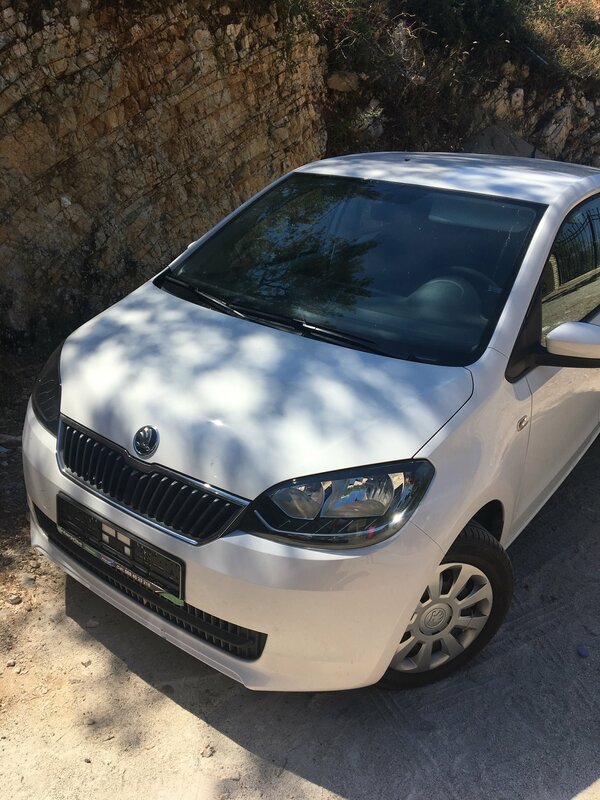 We paid a little more for our rental than some of the local companies charged, but we got a nice new vehicle (important up in the mountains), and when we needed a replacement vehicle (someone stole our license plates), a new one was brought to us in about an hour. Folks we met along the way who rented from local companies complained about poor quality vehicles and lacking customer service. If we had to do it again, we’d again rent from Enterprise. 3. Get an International Drivers License? By our rental car company, we were told that Americans can use their American driver’s license in Albania. We decided to trust them, but it seems they might have been wrong. Anything to make a sale, right? Regardless, we followed the rules of the road, so we never got stopped. However, in retrospect, we probably should have gotten an international driver’s license. Given that there are ~195 countries in the world, we’re not going to research each one for you here, but suffice it to say, you should definitely Google around to determine what documents you’ll need in order to legally drive in Albania. Before you depart for your trip in Albania, and while you still have WIFI, download the entire country of Albania on your Google Maps app. If you don’t know how to save part of a Google Map to your phone so that you can use the map even when you’re offline/have no service, iPhone instructions are here, and Android instructions are here. 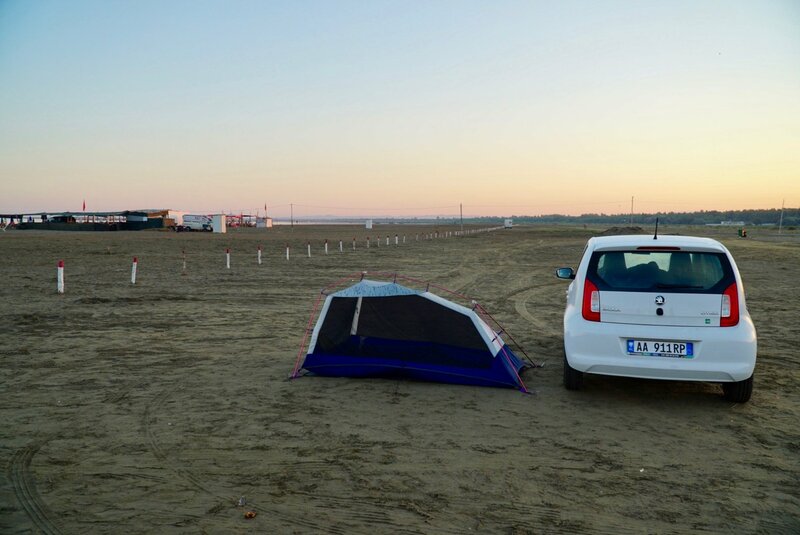 For a few nights, we stealth-camped on public beaches. It was thrilling, free, beautiful and deliciously spontaneous. 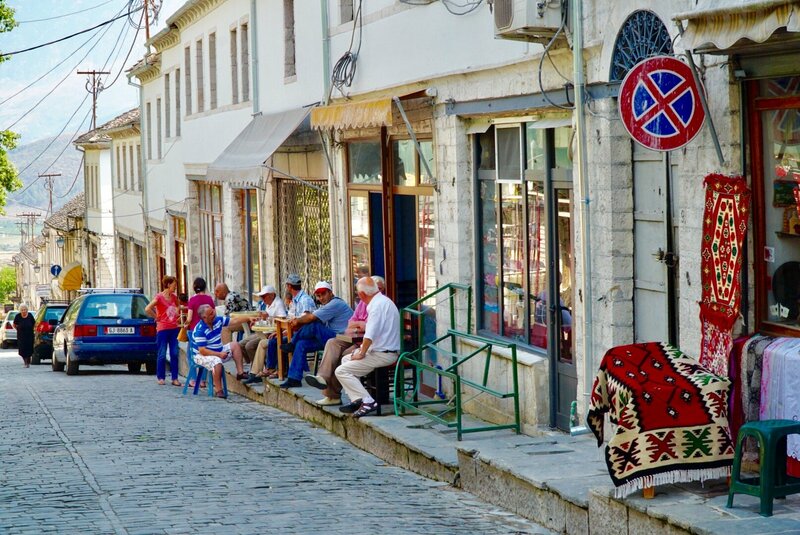 Our road trip in Albania would not have been the same if we had not experienced this relaxed and casual part of Albanian society. Moreover, we would not have been rewarded with all the unplanned and deeply memorable experiences that happened as a result of our unplannedness. In our entire 8 days, the only formal accommodations we stayed at were Hotel Palace Lukova and the Adrian Agustin Rooms*. For the rest of the time, we camped out. 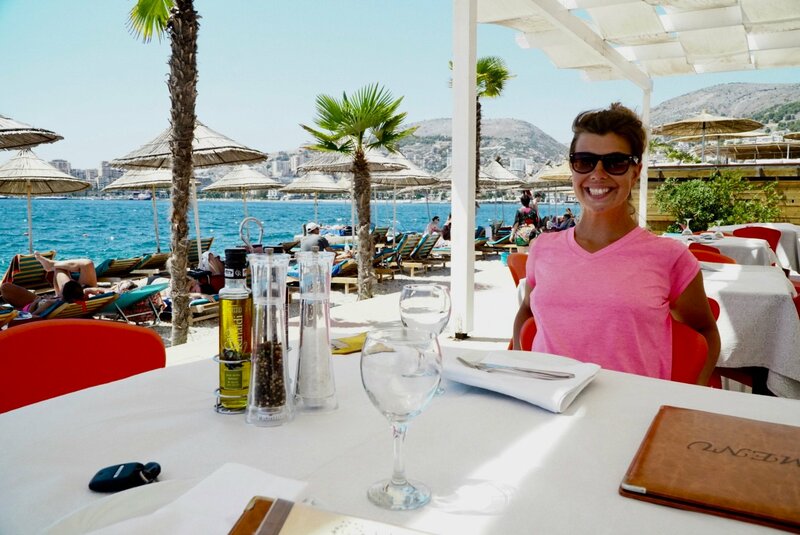 The appeal of this hotel is the STUNNING view from their poolside as well as their DELICIOUS, fresh and affordable Albanian food. If you stay here, plan on getting some amazing value, but understand the value is not coming from the quality of the room. The room we had was a bit dated, didn’t have a working TV, had slightly working air conditioning, and the mini-fridge barely kept anything cold. As we are VERY low-maintenance folks, this didn’t bother us at all, especially since we were relaxing by the pool or beach for the majority of the day time. We are including these details for sake of providing you full disclosure on the nature of this place, not to suggest in any way that we didn’t absolutely love this place! 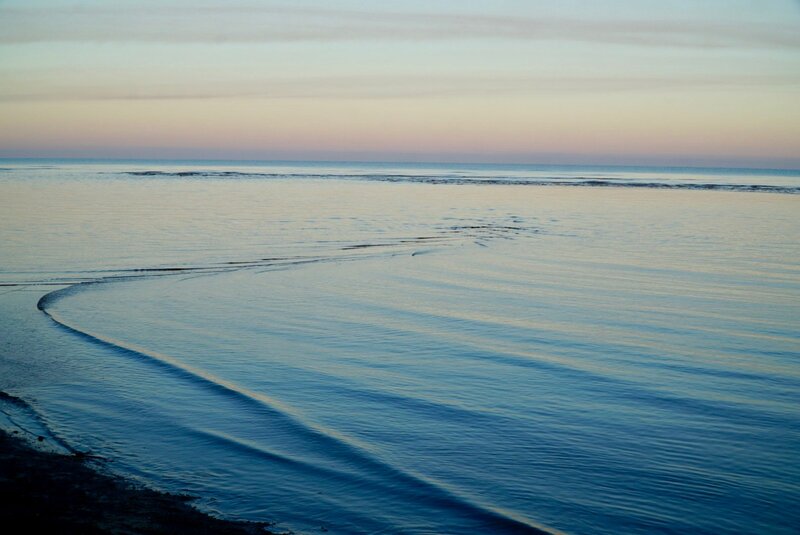 The appeal of this place is that you’ll be 5-minutes walking from a desolate pebble beach. On the beach is a tiny seafood shack called Old Anchor which sells only what they have caught fresh that day. The food, again, is spectacular. However, the Adrian Augustin Rooms are spartan. There is no air conditioning here (only a fan), and there is no food available either. They do have a small kitchenette in each room. However, if you stay here, you’ll have to scrounge up some groceries (there are not many well stocked stores around) or, you’ll have to go out to eat at any of the nearby restaurants. There are nice restaurants about a 15-minute drive away on a neighboring beach. Or again, you could go to Old Anchor, just at 5 minute walk away. As I said before, we’re very low key folks, we spent all day outside anyway, so this budget accommodation was quite appealing to us. We just want you to know this place is very basic. 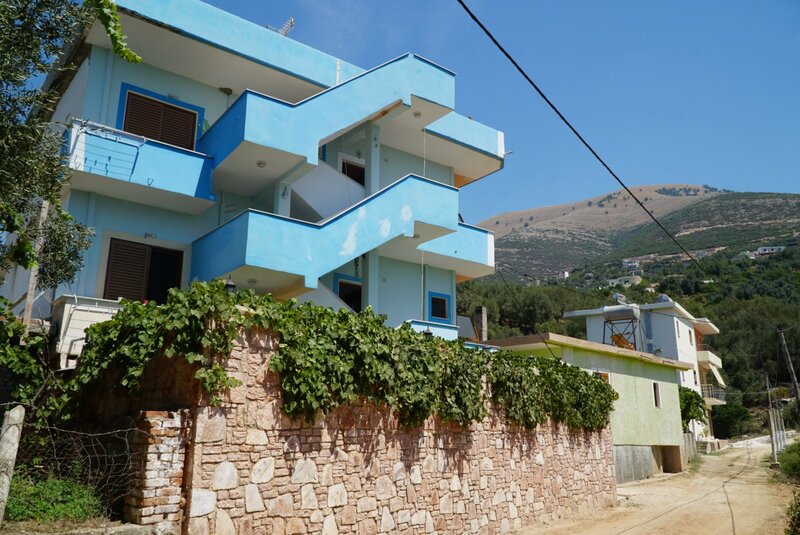 And now, the part you’ve been waiting for, pictures from our road trip in Albania. 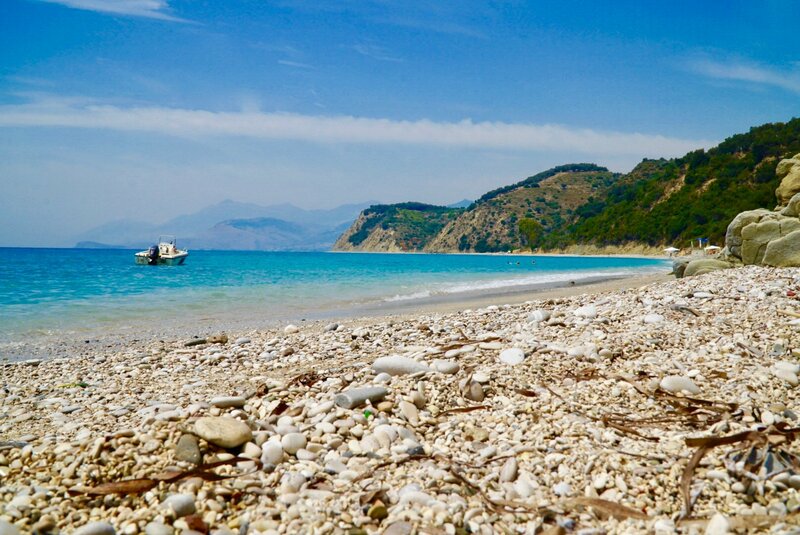 In many of the picture captions below, we’ve put a lot of important details you’ll want to know when planning your own road trip in Albania (as well as details about a secret campsite we found), so take your time to enjoy these pictures, just as we hope you will take your time when you’re on your own adventure through this spectacular country! 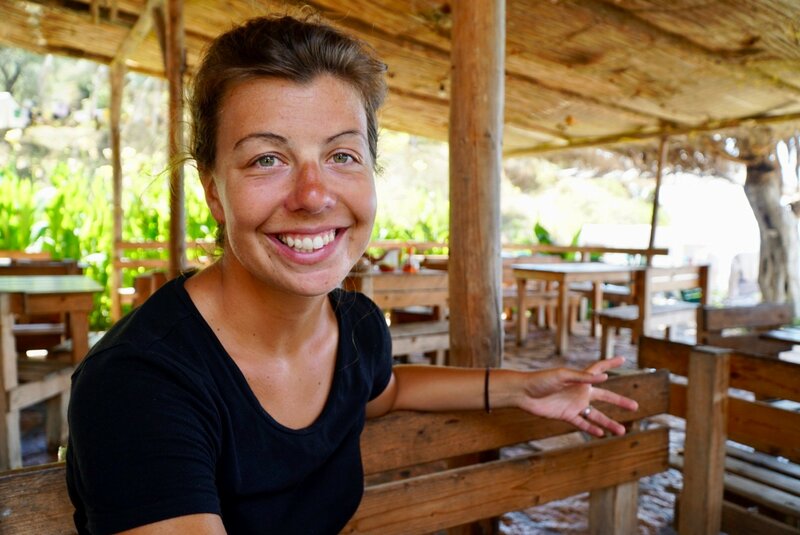 Havana Loca – When we arrived here in the afternoon, we didn’t realize that it would be in this very parking lot that we’d be camping, on our very first night in Albania. 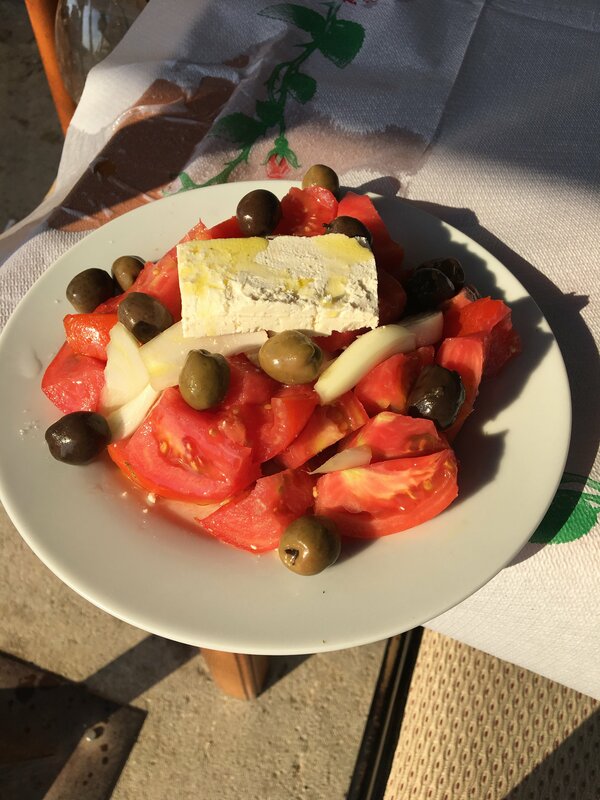 Havana Loca – They served delicious food, including Greek Salad! 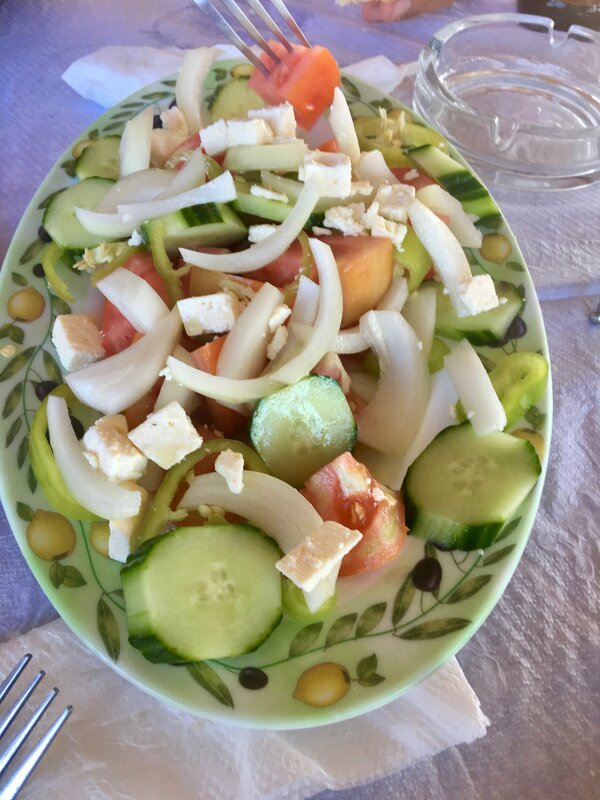 At the time, we had no idea that this wasn’t “Greek” salad, but rather the typical style of salad served all over Albania. And it was DELICIOUS! 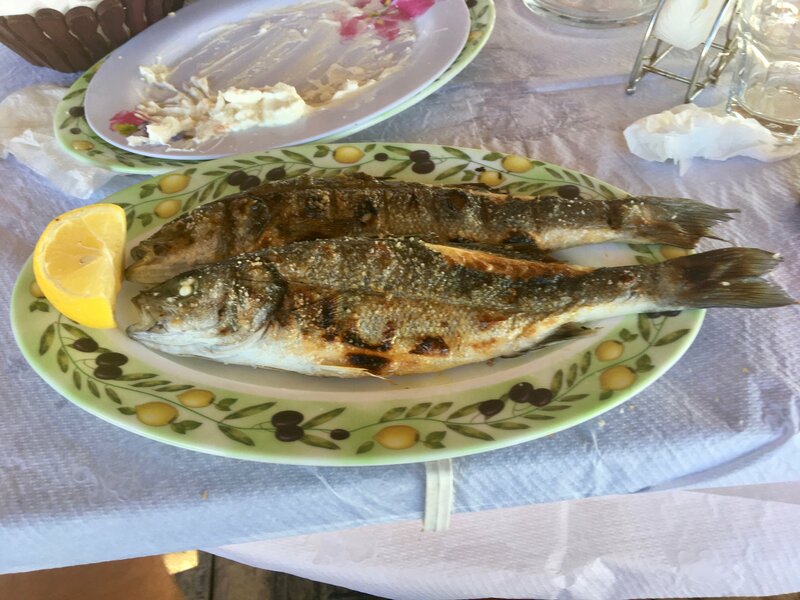 Havana Loca – This was our first taste of Albania’s amazingly fresh sea food. Havana Loca – Nothing makes us happier than exploring a new place together without having any sort of time constraints or schedule! 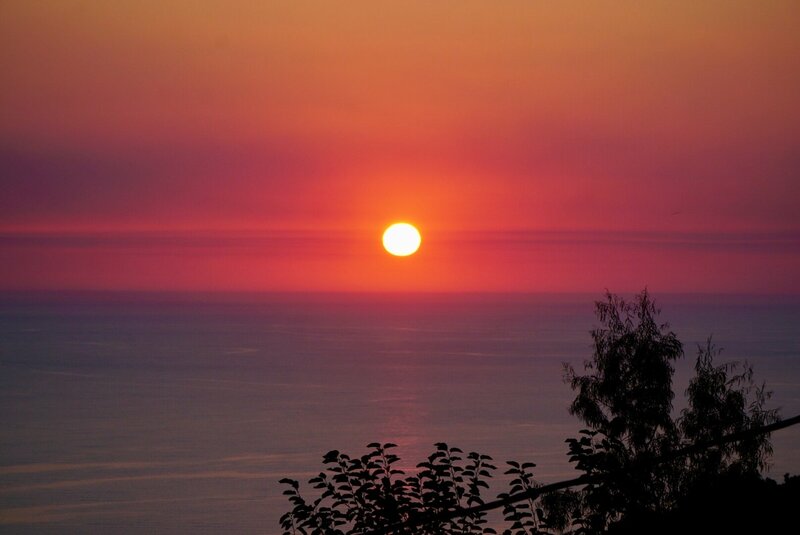 Havana Loca – Our first sunset on the Adriatic Sea. Havana Loca – More of this brilliant sunset. Havana Loca – Post sunset it got comfortably cool, and the water calmed down. Once it was completely dark, we went to sleep. Havana Loca – The next morning we discovered that we were the only ones who camped out in the parking lot, but locals told us it would be okay, and it was. Although, there were a few motorbikes that passed by at night and woke us up. 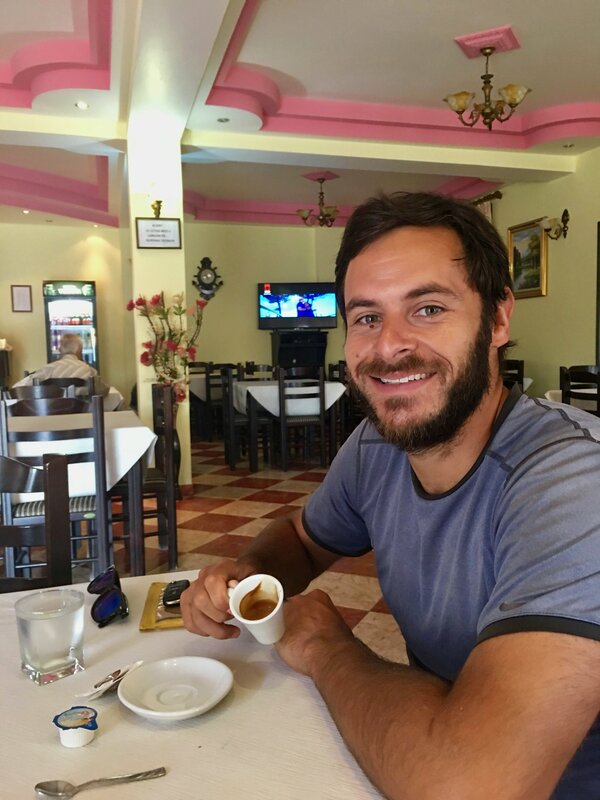 Amazing Espresso – I’m feeling very happy here because this was the BEST espresso I have ever had. The crema actually tasted like cream. Make sure to stop here if you like coffee! Roadside Market – I believe we were here on a Monday, and as it turned out, it was market day. 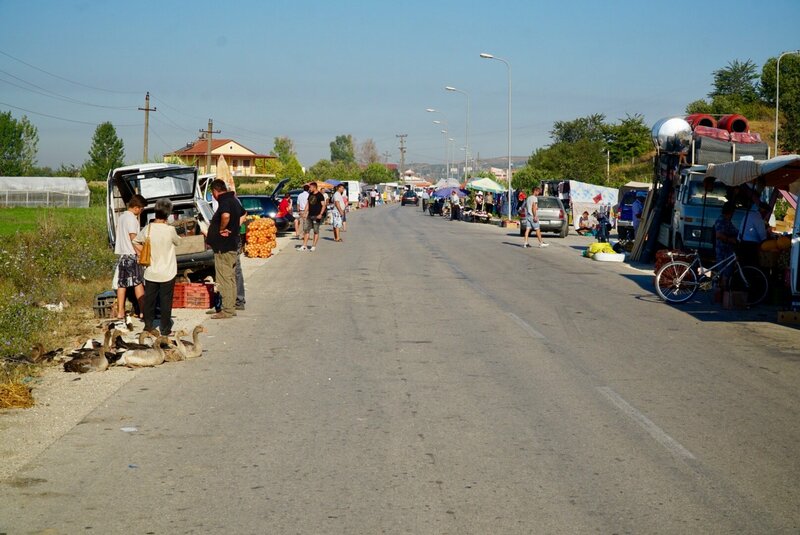 Roadside Market – There was a ton of fresh produce. The vendors seemed a bit surprised to see us there, but they were very friendly nonetheless. 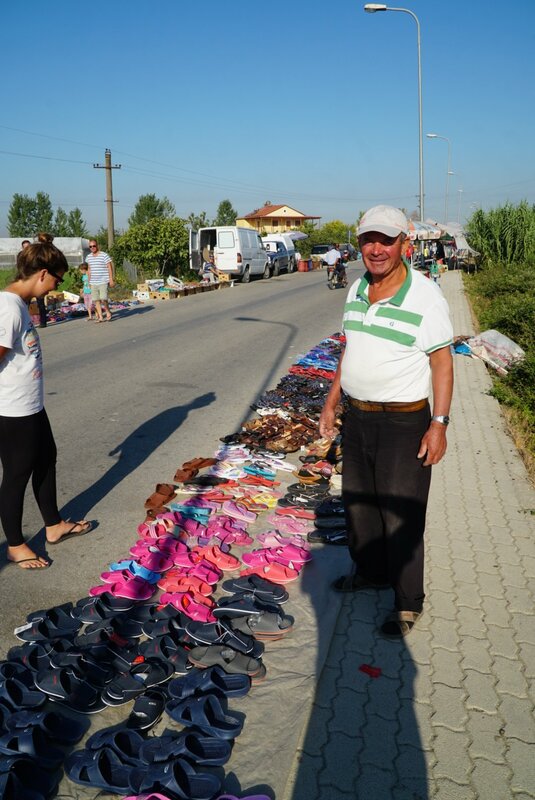 Roadside Market – You can never have enough flip-flops! 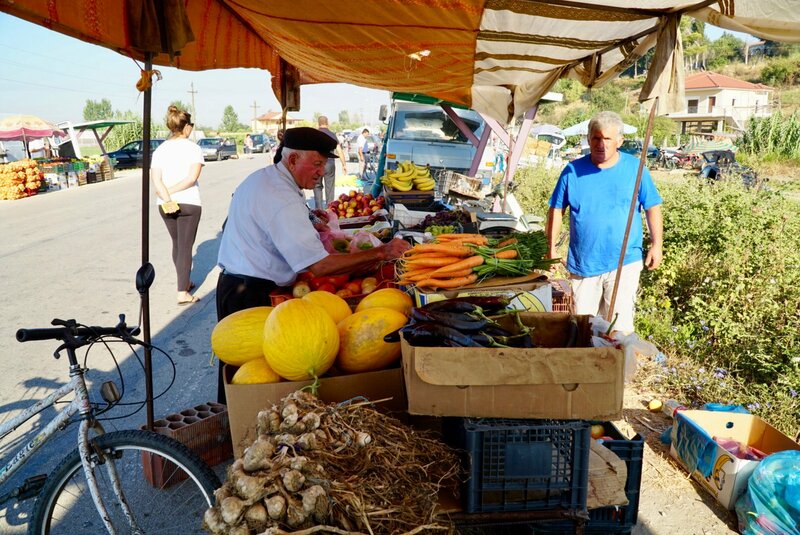 Roadside Market – And then we hit the jackpot! OLIVES!!! These came from nearby trees, so they were addictively fresh! The best part is that they were 200 Lek (~US$2) per kilo. 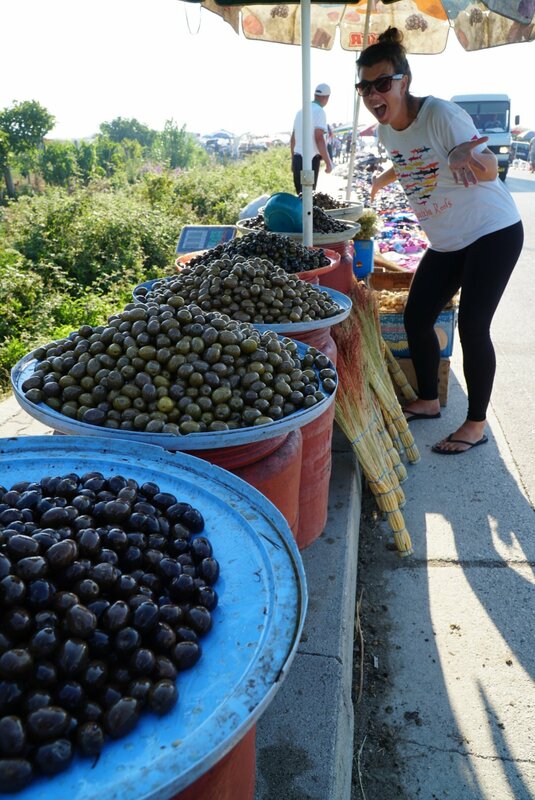 Roadside Market – So, we ate olives for breakfast that morning. Yes, only olives. And we each probably ate about half a kilo. It was a perfect start to our day! 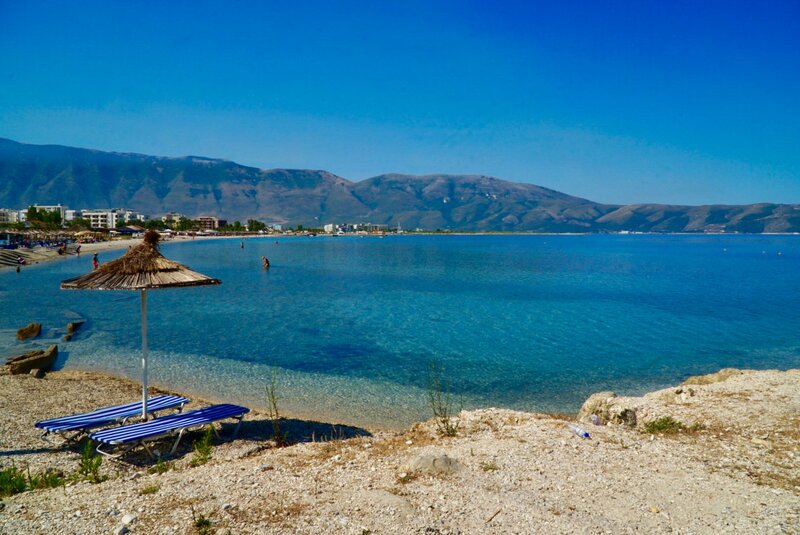 Vlorë – This photo was taken a little bit south of Vlorë. We got out here to stretch our legs, and we never got tired of the views of the Adriatic Sea. Llogara Pass – This was one of the views going up Llogara Pass. There are TONS of beautiful scenic pull offs, so take your time and enjoy the views. Llogara Pass – This was one of the views going down Llogara pass. Again, we never got tired of seeing the Adriatic Sea. Gjipe Beach – Probably one of our favorite parts of this trip, we had heard about this “secret” campsite, so we had to check it out. Only 4×4 vehicles can make it down this road, so we had to leave our little rental up at the top of the cliff, and walk our way down. 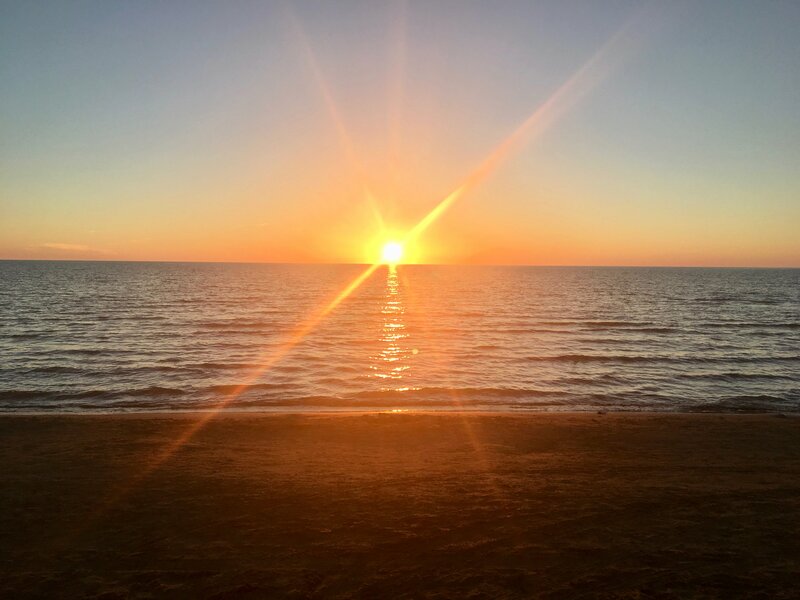 Gjipe Beach – This secret campsite was purely amazing. It was only minimally crowded, full of fun loving hippy types and totally whimsical in it’s design. 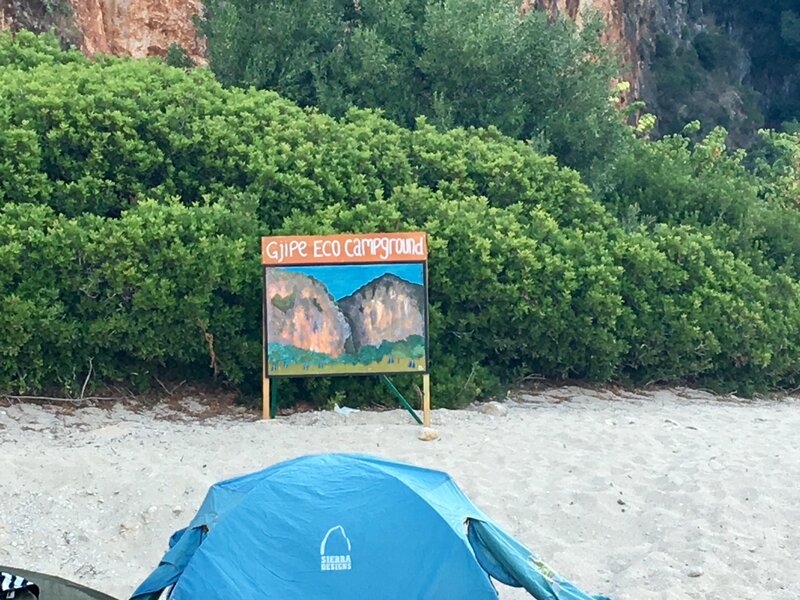 Gjipe Beach – The campground is nestled right at the opening of a canyon, thus the picture on their sign. 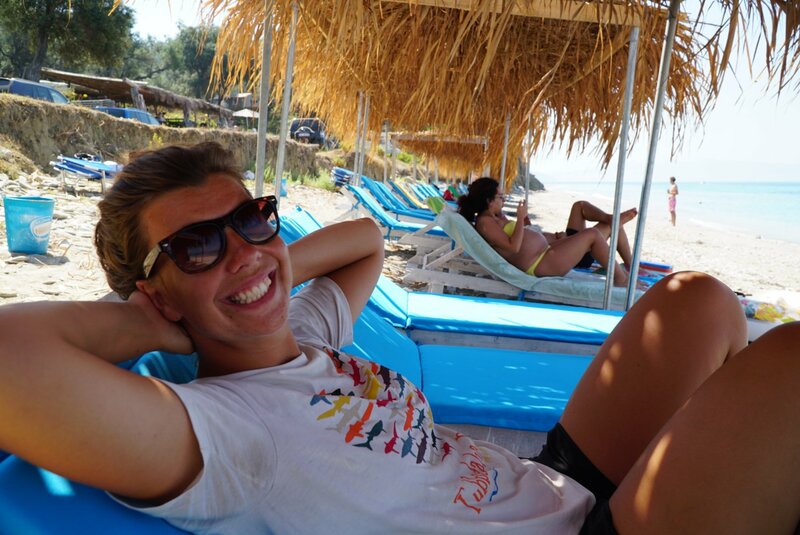 Borsh Beach – We were so chilled out this day, we forgot to take any pictures other than this and the next one! Nonetheless, this beach is a bit lively given the music being pumped from some beachside restaurants, but we still had no problem relaxing. 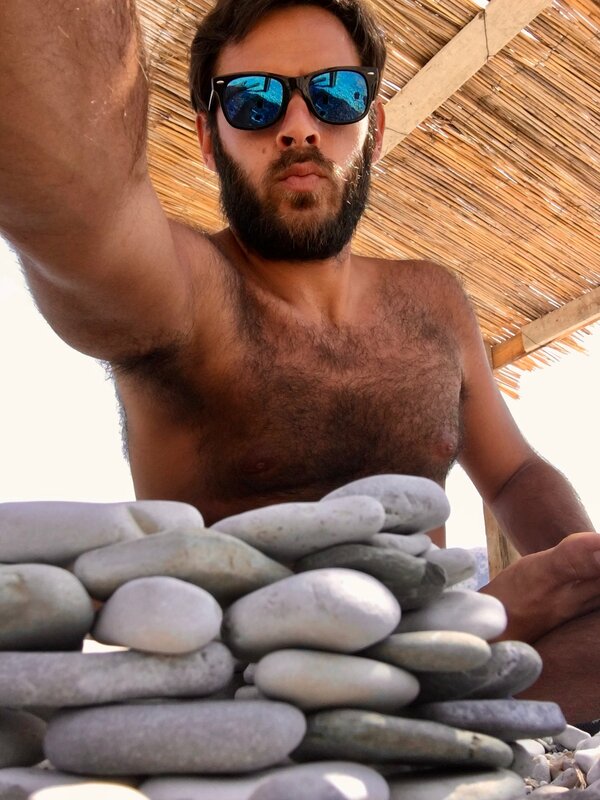 Borsh Beach – Playing with the pebbles on this pebble beach! Hotel Palace Lukova – The entry way to this psudo-luxury hotel. Hotel Palace Lukova – Standing at the pool, looking at the hotel. This place was US$40/night. A veritable steal! Look at the next photos, and you’ll understand why. Hotel Palace Lukova – The outdoor restaurant area. 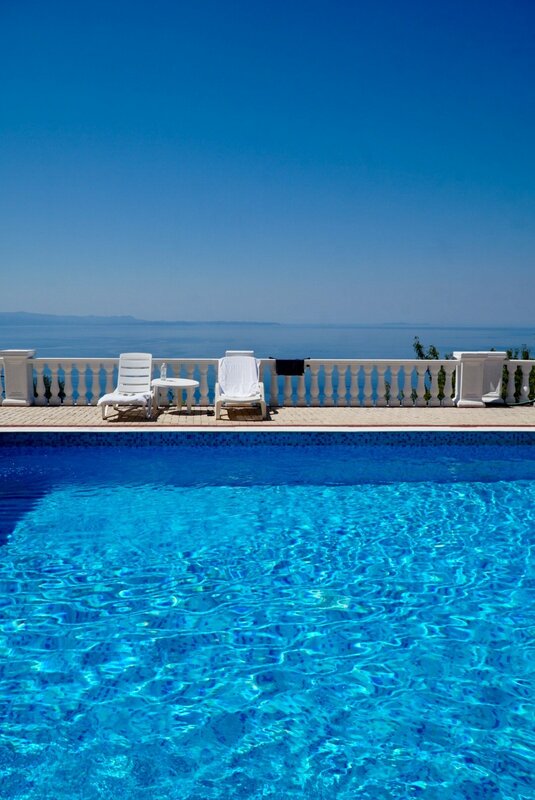 Hotel Palace Lukova – The view from the pool looking out into the Adriatic Sea. Hotel Palace Lukova – The views from here never got old. 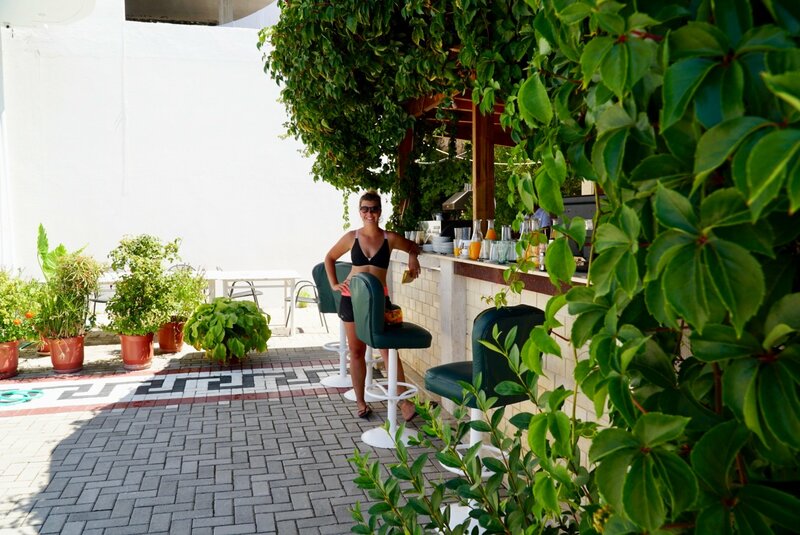 Hotel Palace Lukova – The poolside bar. They served coffee and soft drinks here too. Hotel Palace Lukova – A G&T was just what the doctor ordered, and it was perfect. 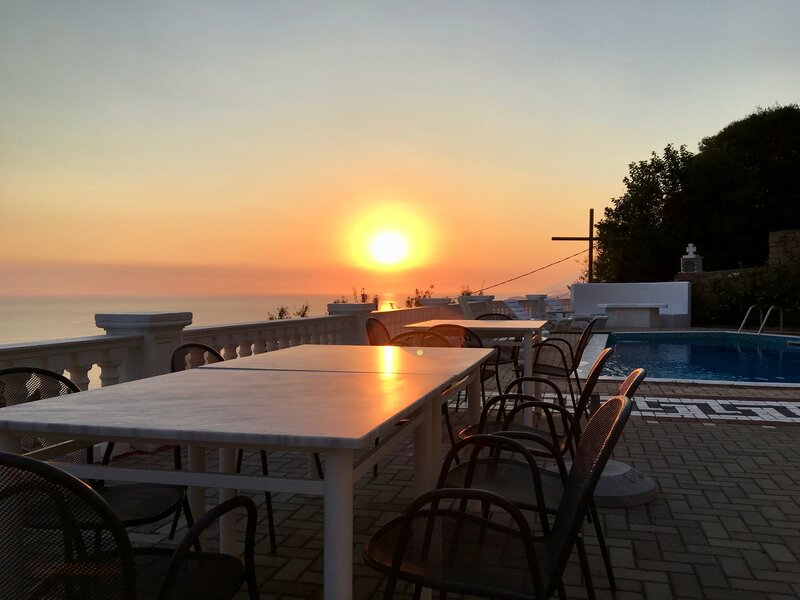 Hotel Palace Lukova – The sunsets from the outdoor restaurant area were spectacular. Hotel Palace Lukova – Enough said. 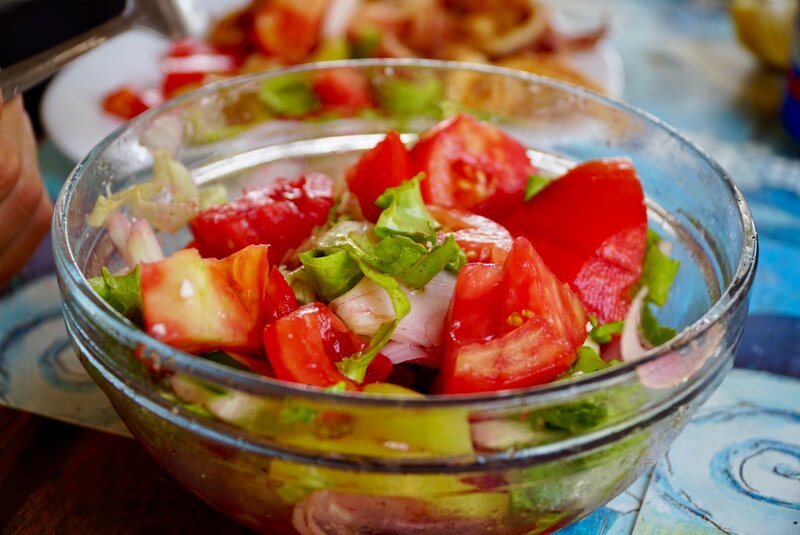 Hotel Palace Lukova – A typical salad here. 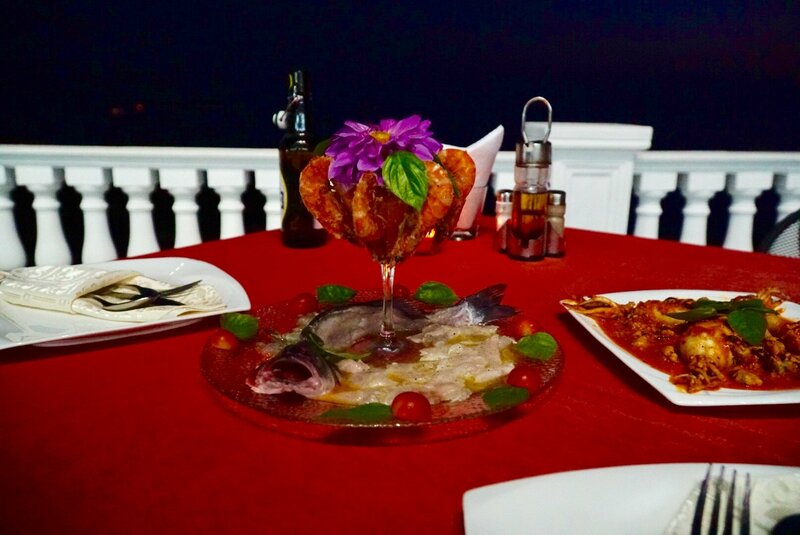 Hotel Palace Lukova – Part of a birthday dinner! Albanian ceviche and shrimp cocktail. 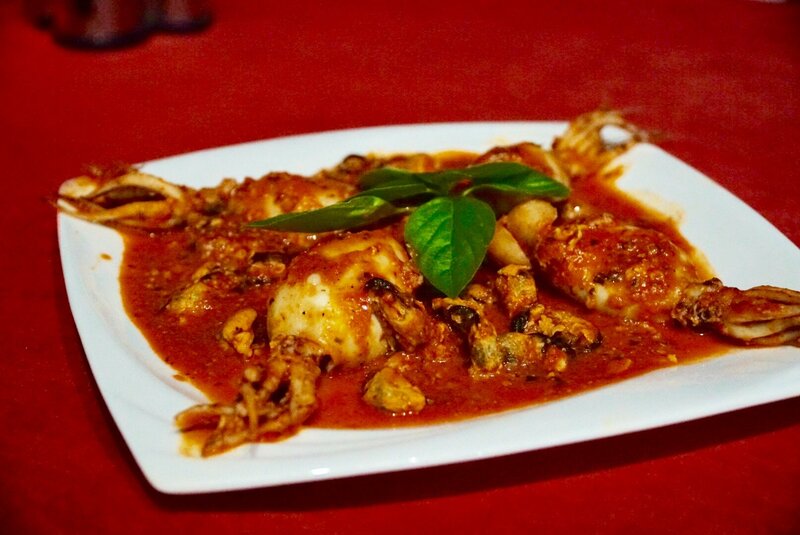 Hotel Palace Lukova – Ridiculously fresh and perfectly cooked calamari in a tomato and white wine sauce. 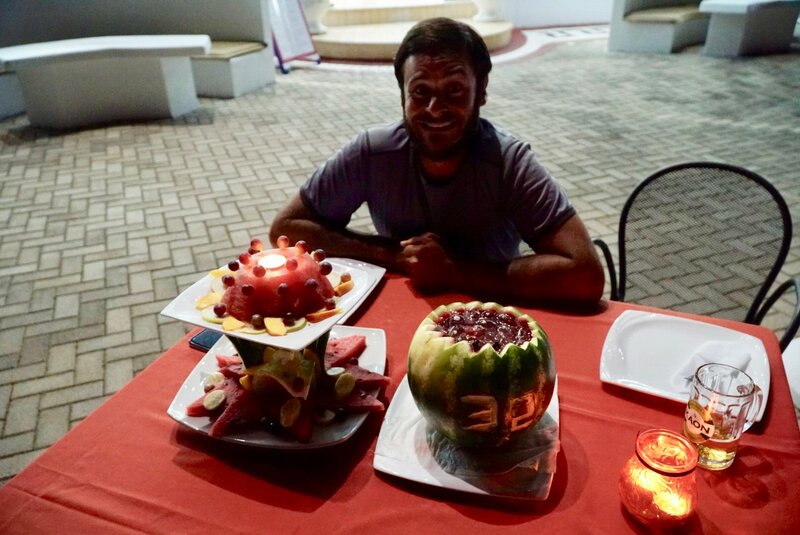 Hotel Palace Lukova – And a birthday fruit platter. 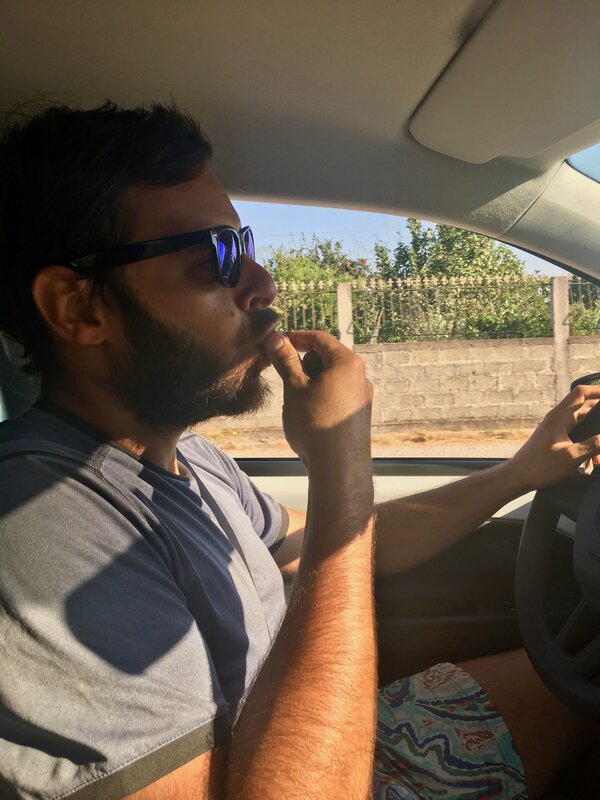 There is no more perfect way to celebrate turning 32 than with a road trip in Albania. 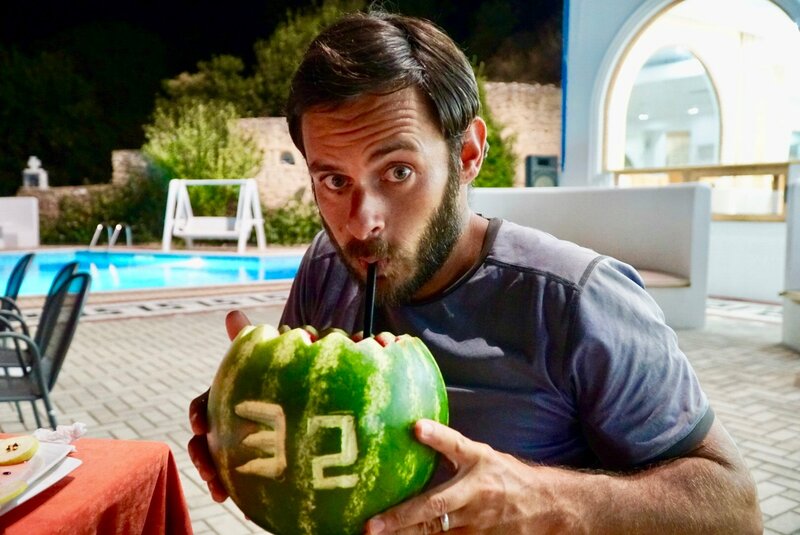 The watermelon was filled with enough booze for a small army, so we didn’t drive anywhere this night. Hotel Palace Lukova – We finished the whole thing. Hotel Palace Lukova – But it was a team effort. Then, we stumbled up to our room and slept really well. 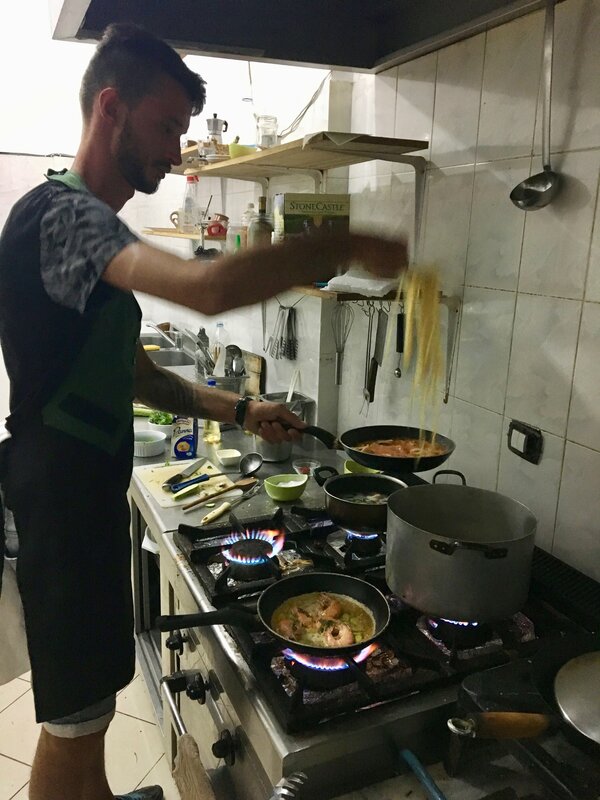 Hotel Palace Lukova – The next night the chef gave us a cooking lesson. The food here was scrumptious. Hotel Palace Lukova – We couldn’t resist taking a selfie, or ten. Hotel Palace Lukova – Again, the sunsets were spectacular, every night. Hotel Palace Lukova – About to depart from the hotel, we noticed our front license plate had been stolen. Hotel Palace Lukova – Enterprise brought us this replacement in one hour flat. It was definitely a jalopy, but we weren’t worried. Adrian Agustin Rooms – For the next few nights, we stayed here. Just down the hill from Hotel Palace Lukova, and thus very close to the beach. 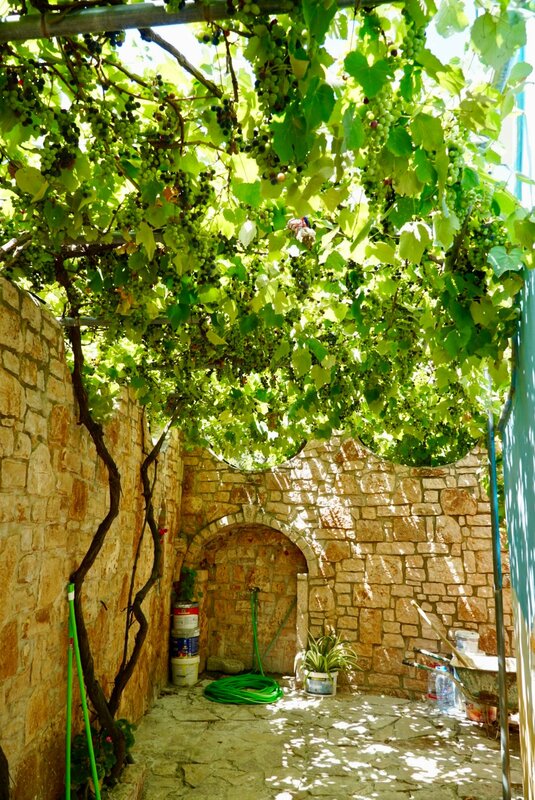 Adrian Agustin Rooms – This guest house was nestled amongst the seemingly never ending Albanian olive groves. Adrian Agustin Rooms – The entryway, again, was full of delicious grapes. 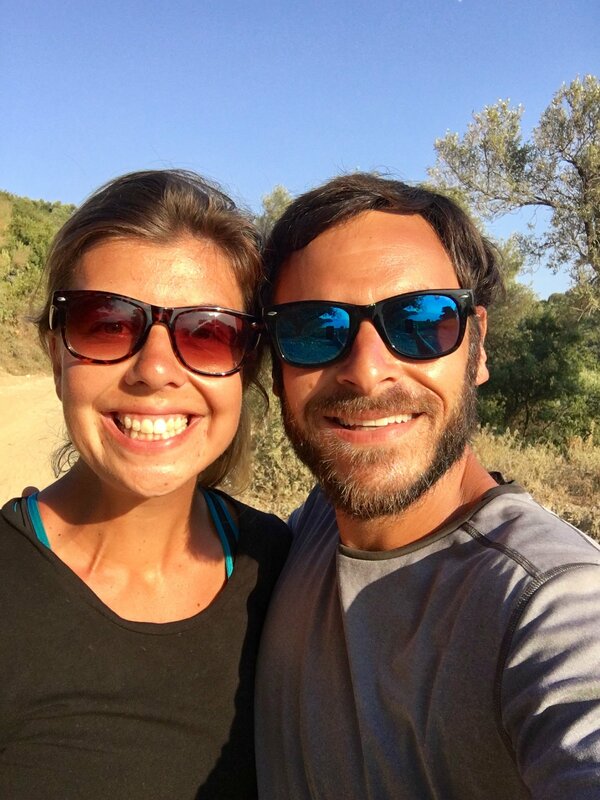 Adrian Agustin Rooms – Us on the short walk down to the beach. Adrian Agustin Rooms – Nearly at the water. We’re just scoping it out for the next day. Old Anchor – This tiny stretch of beach is ~5 minutes walking from the Adrian Agustin Rooms. It was never more crowded than this. It was totally quiet, and the restaurant down here, Old Anchor, served delicious food. This was our favorite beach on the whole trip. Old Anchor – We rented beach chairs for 150 Lek (US$1.5) per person, per day. 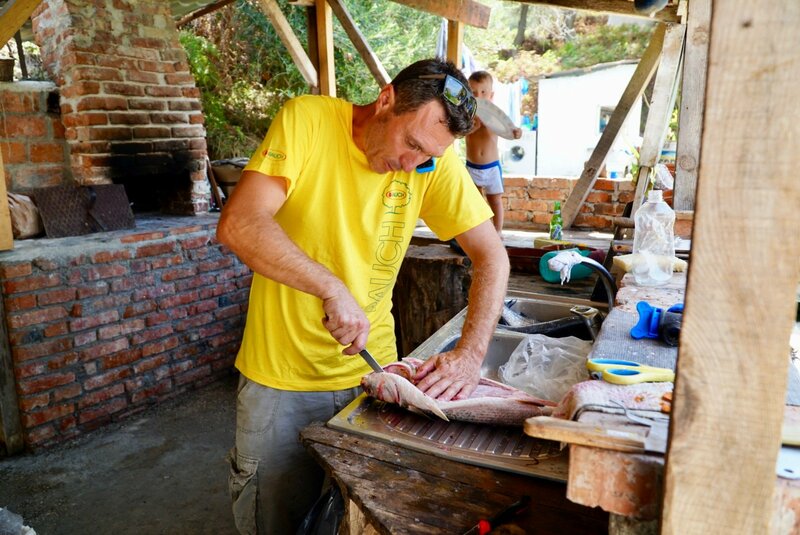 Old Anchor – These guys were brining fresh fish to the restaurant. Old Anchor – About one minute walking from where the beach chairs were, we got to this stretch of beach. 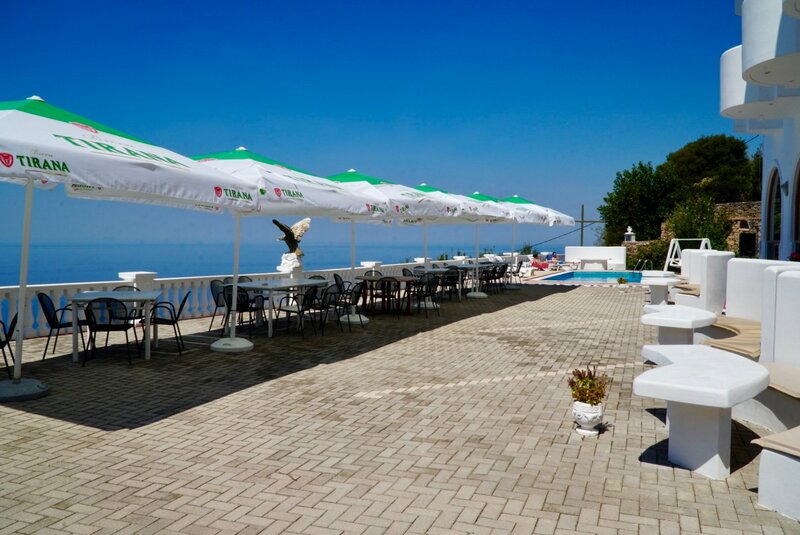 Old Anchor – Looking away from the beach chairs, south into the Adriatic Sea. Old Anchor – The view from the restaurant. Not bad, huh? Old Anchor – There is nothing like sharing a meal with someone you love! Old Anchor – Again, everything was super FRESH! 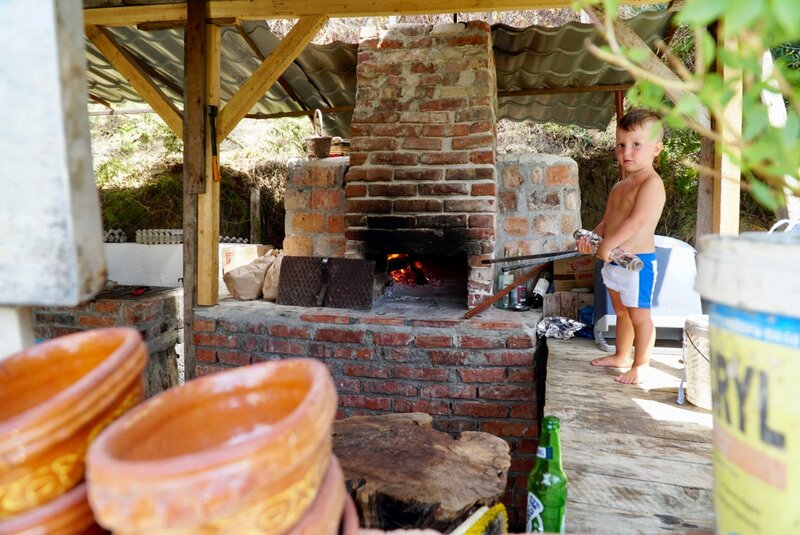 Old Anchor – This little guy was the chef in training. 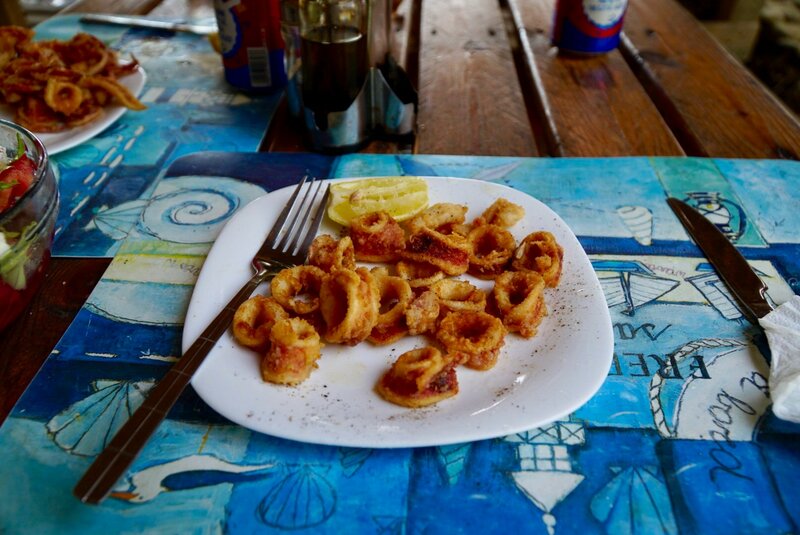 Old Anchor – Fried calamari. Old Anchor – Fresh salad with local ingredients. 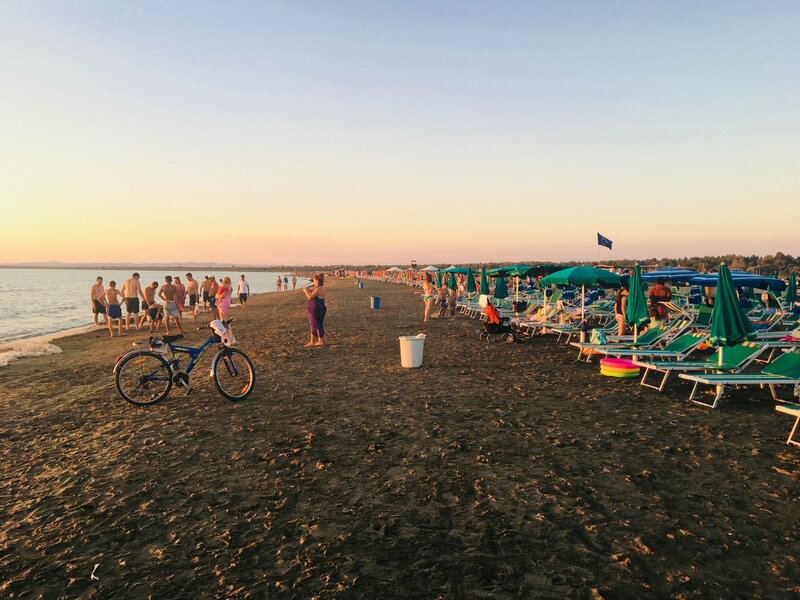 Plazhi i Lukovës – As we mentioned, there is no food at the Adrian Augustine Rooms, so we went to this beach for dinner. Plazhi i Lukovës – Another beautiful sunset. 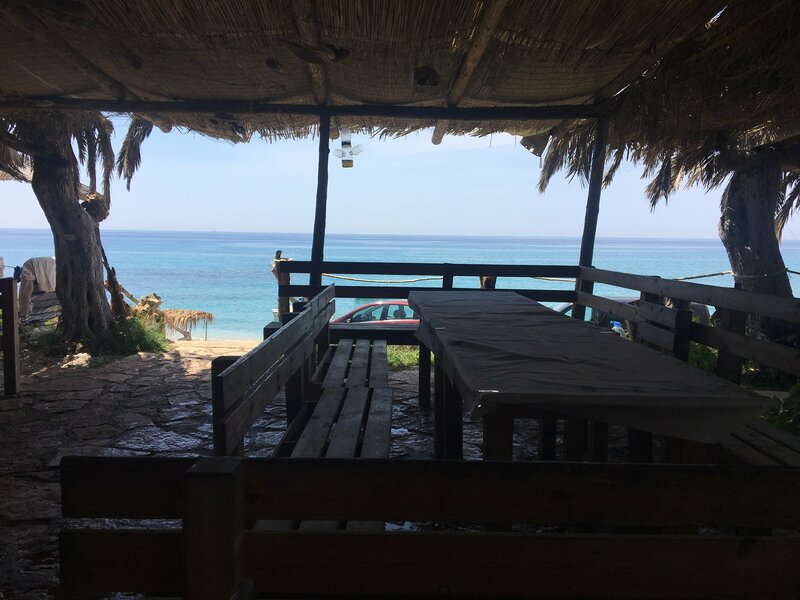 Sarande (Resorant Demi) – We only spent an afternoon in Sarande, as it was too crowded, too noisy and too touristy for our tastes. The view from Resorant Demi was nice though. 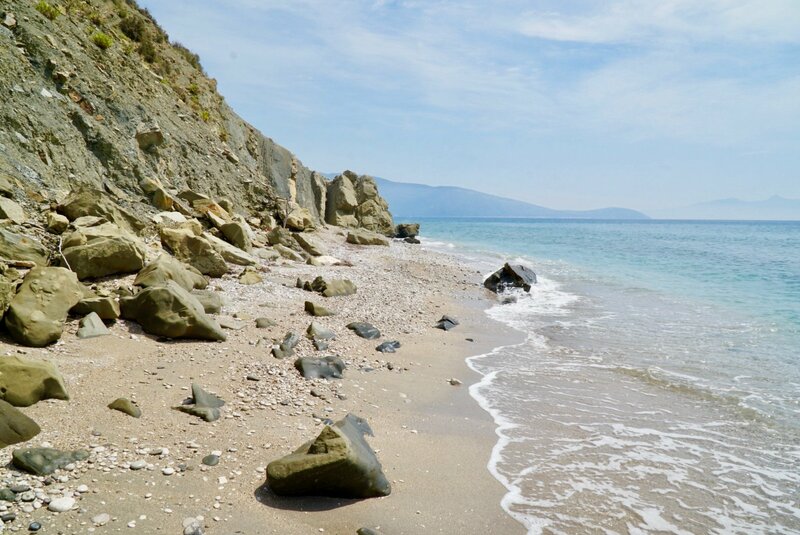 Sarande (Resorant Demi) – We did not find any sand or pebble beaches in Sarande. It was all this paved shoreline wherever we went. 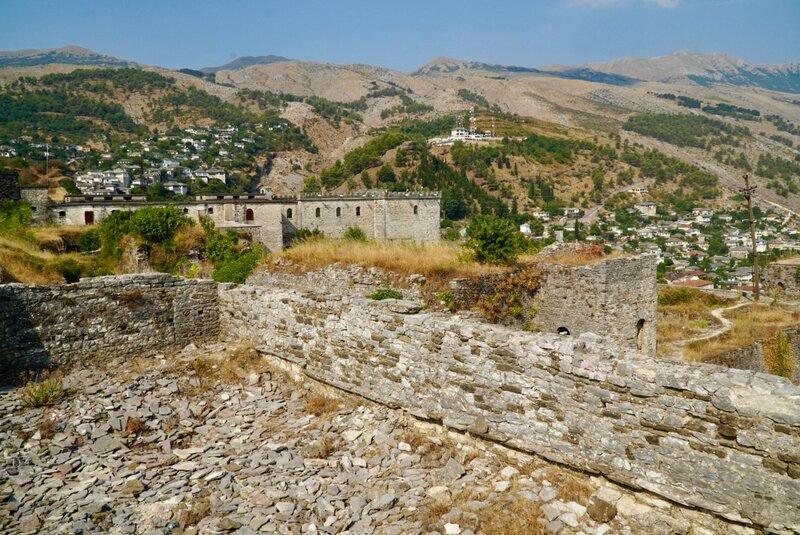 Gjirokaster Castle – This 12th century castle is definitely worth having a stop at. We almost skipped it, and we’re glad we didn’t! 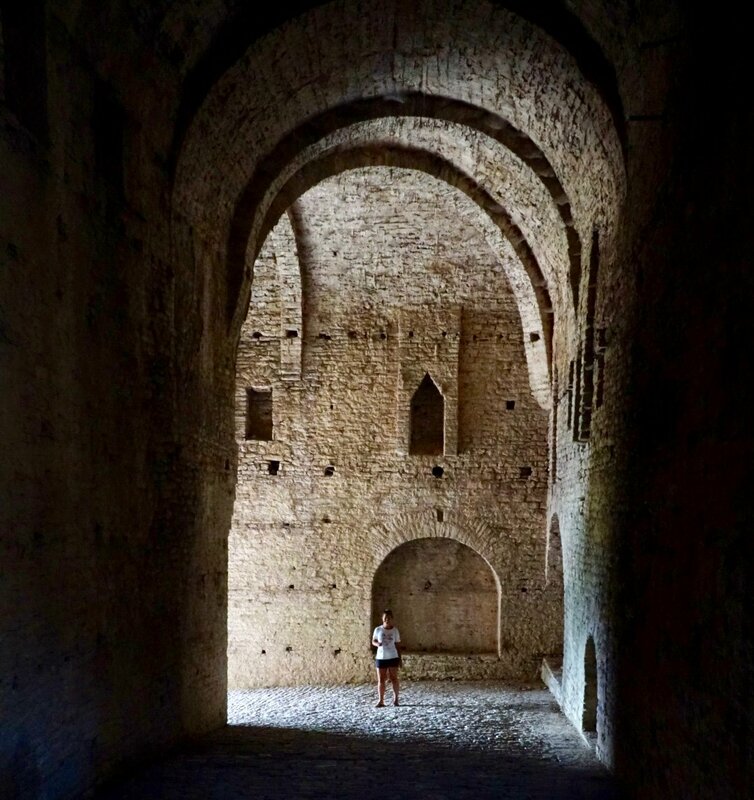 Gjirokaster Castle – Inside the castle there were tons of ancient feeling passageways. 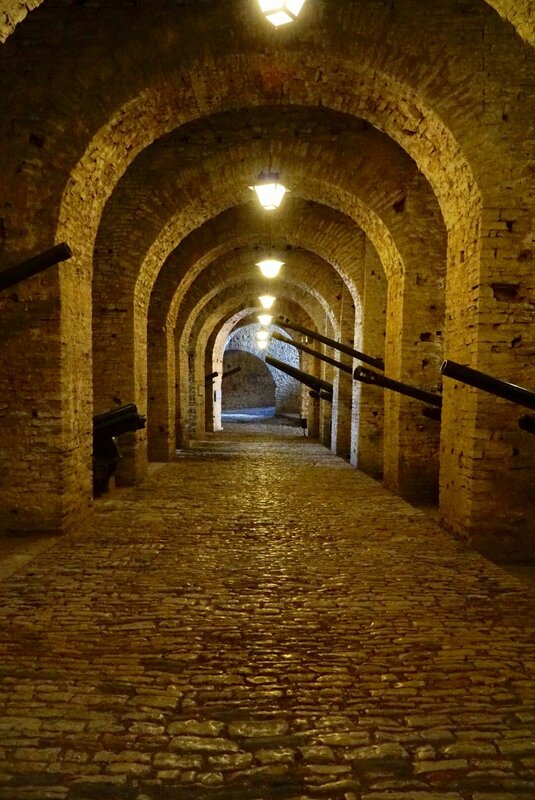 Gjirokaster Castle – There are some old WWII relics stored inside the castle. Thus, the modern looking artillery barrels. 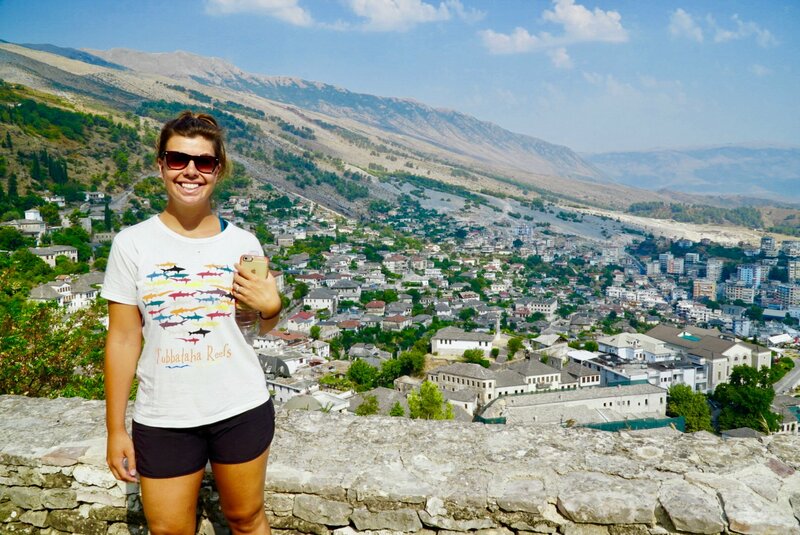 Gjirokaster Castle – Another stunning view from atop the castle. Gjirokaster Castle – Looking behind the castle up in to the mountains. 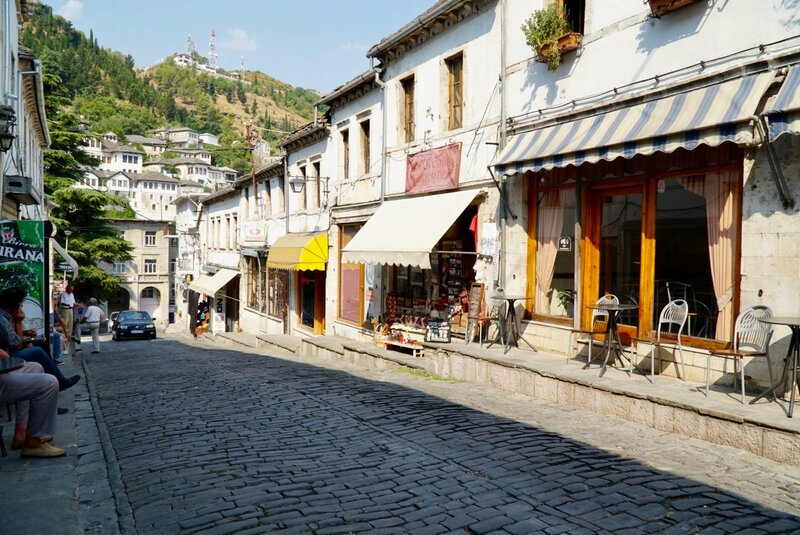 Gjirokaster Castle – In the town below the castle, there are countless quaint cafes, shops and bourekas shops. Gjirokaster Castle – We definitely stopped at one of the bourekas shops. 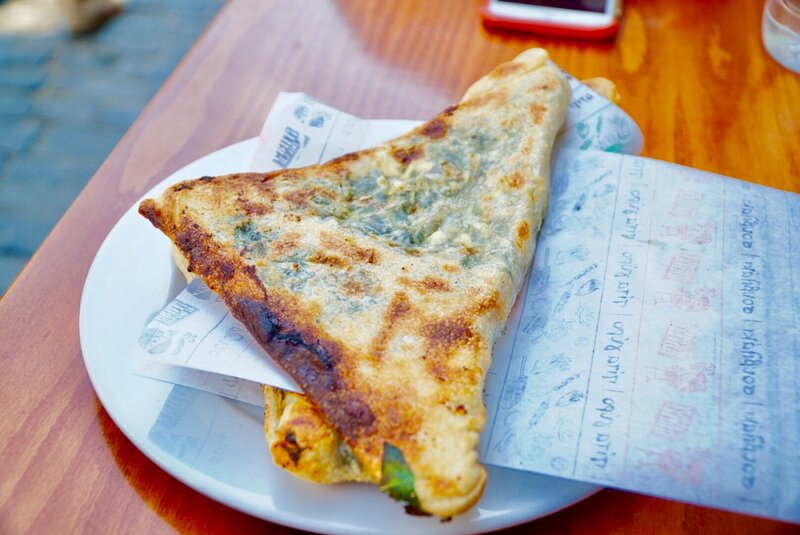 Gjirokaster Castle – I think we ate about 5 of these bourekas. It was spinach and feta heaven. 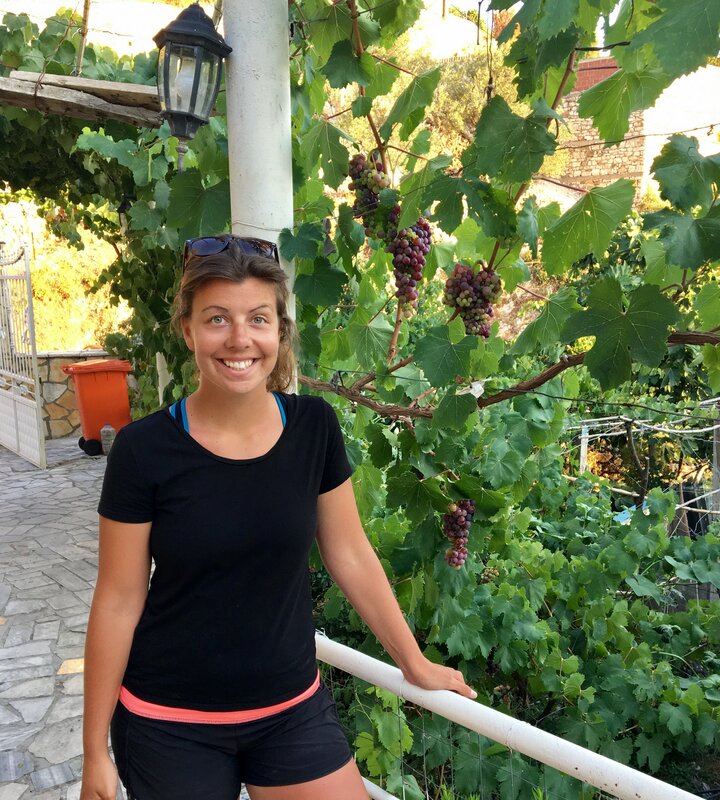 Gjirokaster Castle – Then we meandered through some gift shops. Gjirokaster Castle – A little bit of gift shopping! 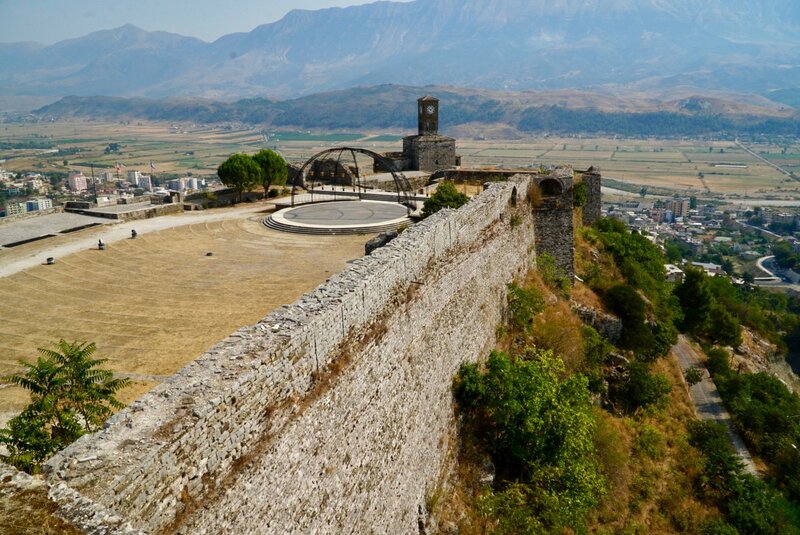 Gjirokaster Castle – Eventually we got back in our car, and we headed back to Tirana. 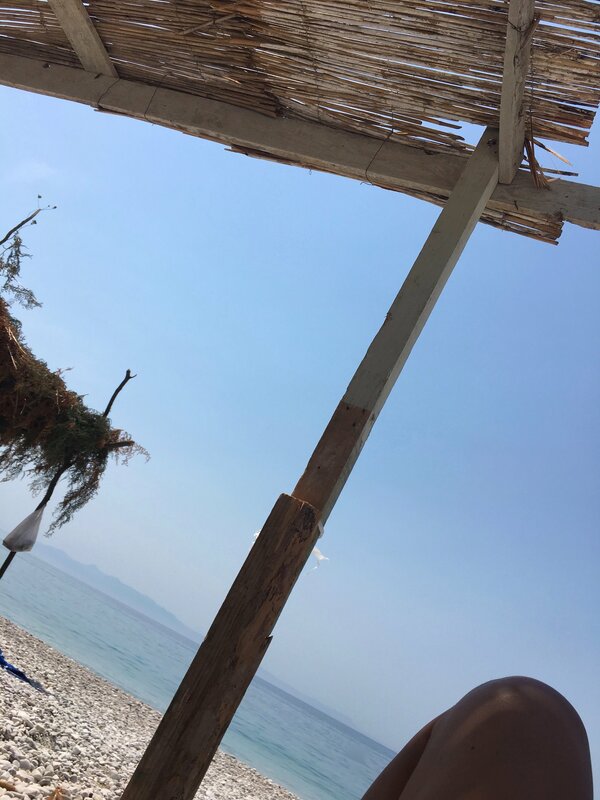 The only thing left to do is start planning your own road trip in Albania, and if you want to ask us any questions, feel free to drop us a line here. 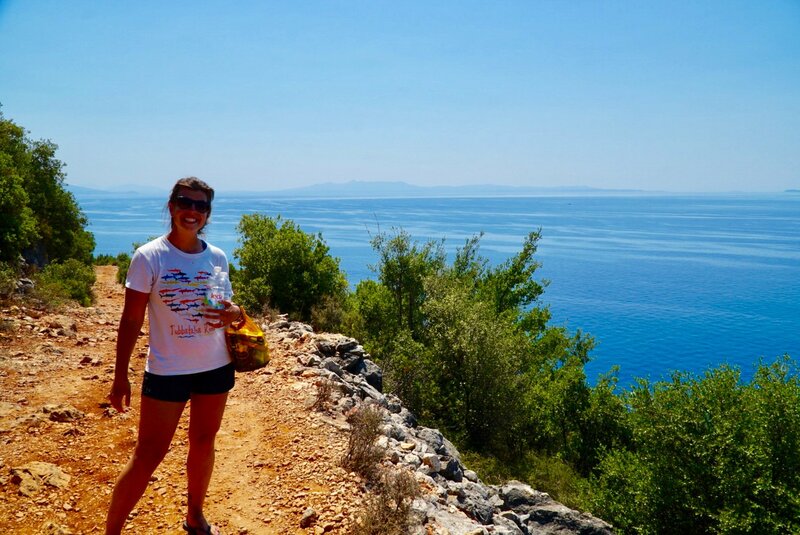 If you’re looking for a gorgeous and active adventure travel experience to do either before or after this road trip, you should seriously consider backpacking on the Via Dinariac Trail in nearby Montenegro. 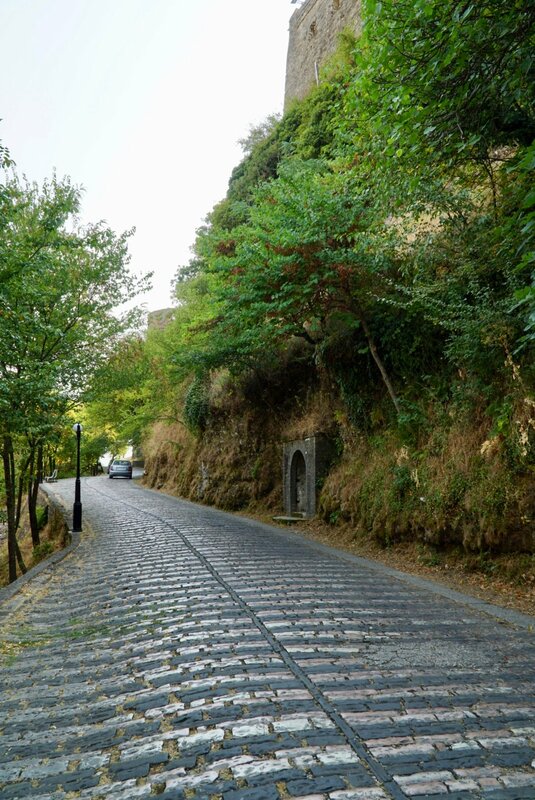 You can check out our Via Dinarica Trail Guide here, and our Via Dinarica Trail itinerary here. And whatever you do, leave us a comment below letting us know what you think about all of this! 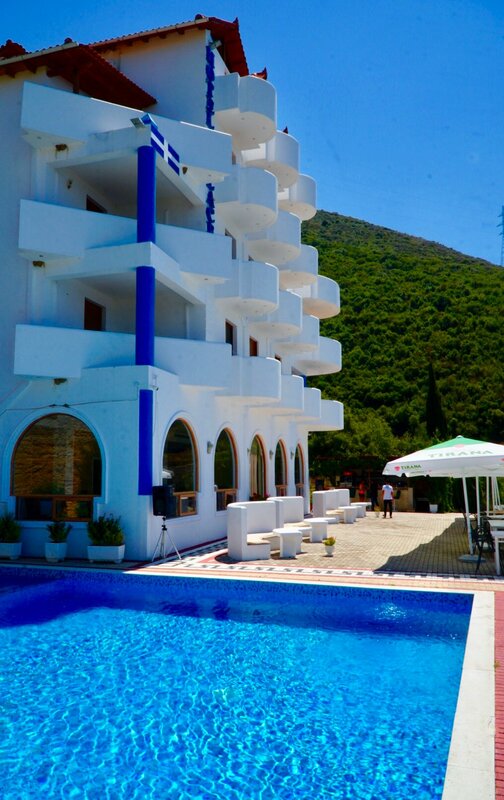 We planned to spend our holiday in Albania, we chose Lukova and Adrian Agustin room. I read the rows of your journey. Super holiday. Congratulations.